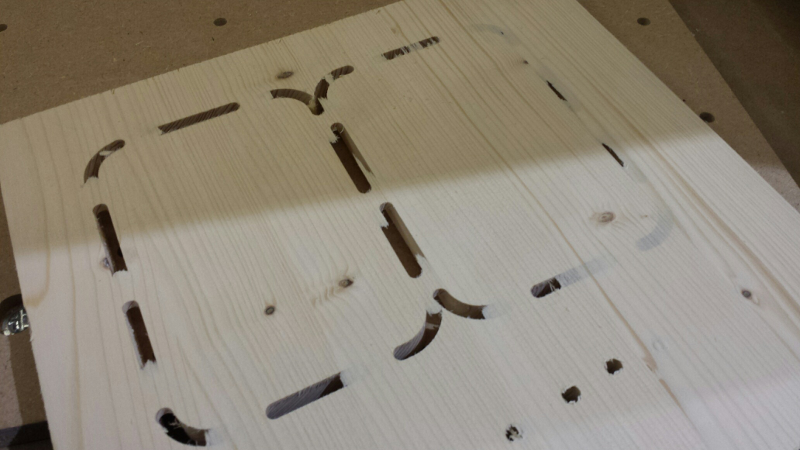 I had been thinking about getting a CNC machine for years, for all these project moments when I told myself “wouldn’t it be nice if I had a way to cut this enclosure/part in a cleaner/faster way?”. 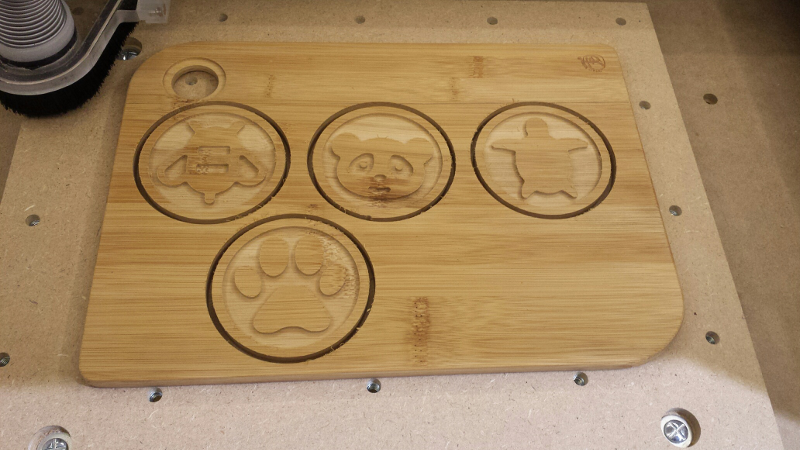 For a long time I told myself the investment was not worth it in my case, but I eventually decided to go for it anyway, more for the sake of getting a little CNC experience than for a real specific need. building one from scratch: probably the most interesting in terms of learning experience, but beyond the time it would take, I felt I would end-up with a sub-par machine and would get frustrated in the end. buying a cheapo kit from Asia: definitely the cheapest option, but even though I buy dirt cheap electronic components there all the time, I am not willing to spend several hundred dollars and not be quite sure of what result I will get in the end. 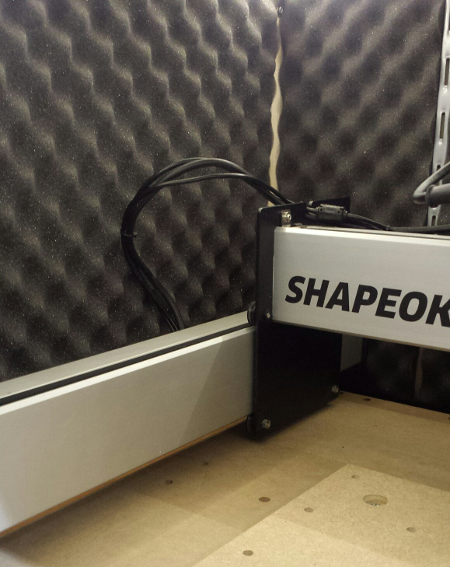 I finally decided on the Shapeoko3 (the standard size version) after a bit more browsing on the interwebs. 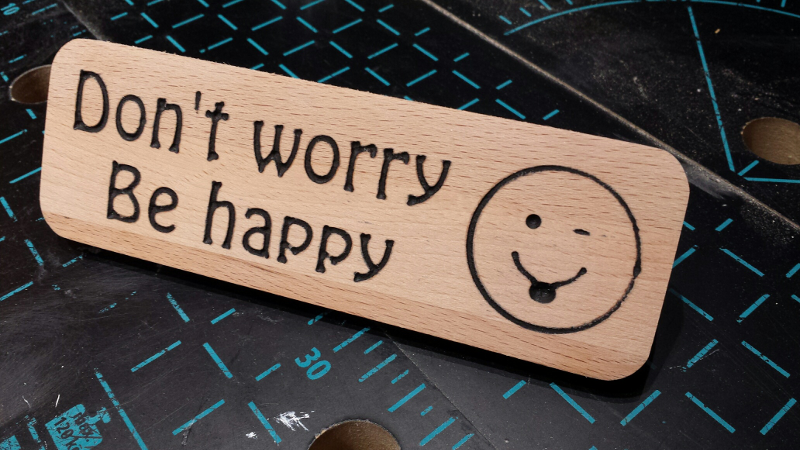 1100$ + shipping + import taxes is a lot of money for a casual CNC experience, but it is also very good value for money considering the quality and versatility of what you get, and I could not find any decent equivalent product locally in Europe. 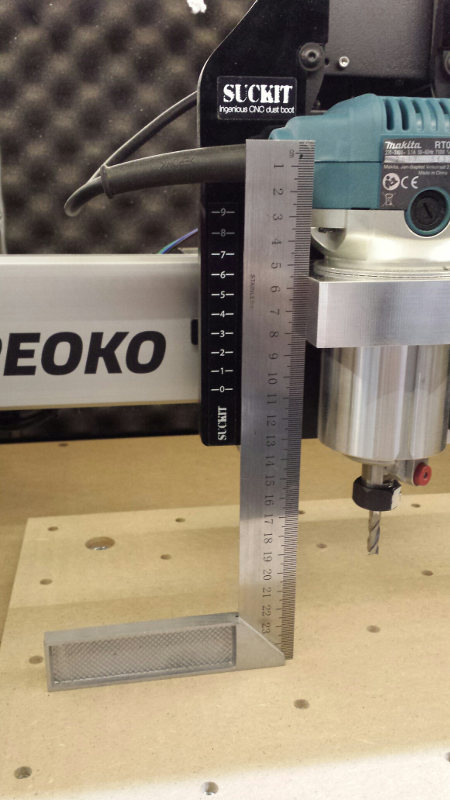 a CNC like the Shapeoko can cut though plastic, wood, and aluminum, includes a router that spins a cutting tool at several tens of thousand RPMs, and moves in three dimensions under the control of software that may or may not have bugs, executing a program that YOU designed : it is in short a beast that is only partially tamed, so as the manual says, “Use common sense” if you don’t want to loose an eye or finger. Also, make sure you have a kill switch / emergency stop button at hand, that removes all power from the machine. 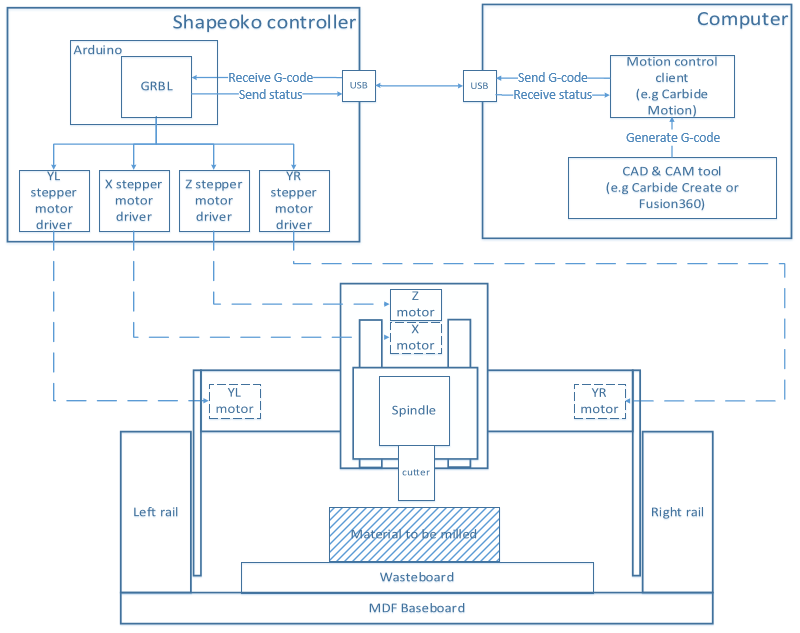 the controller communicates with a host PC over USB to receive milling programs (in G-code format), and uses GRBL to interpret them into actions on the motors, and send back real time statuses. 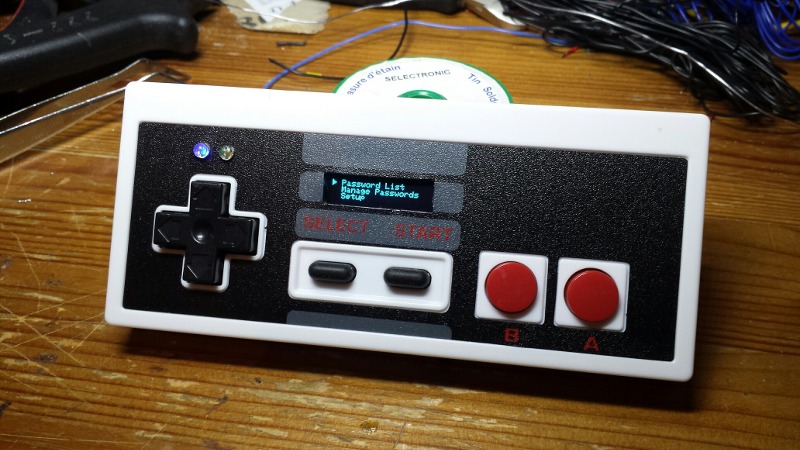 the controller has its own power supply (not shown), the router is powered separately from mains. 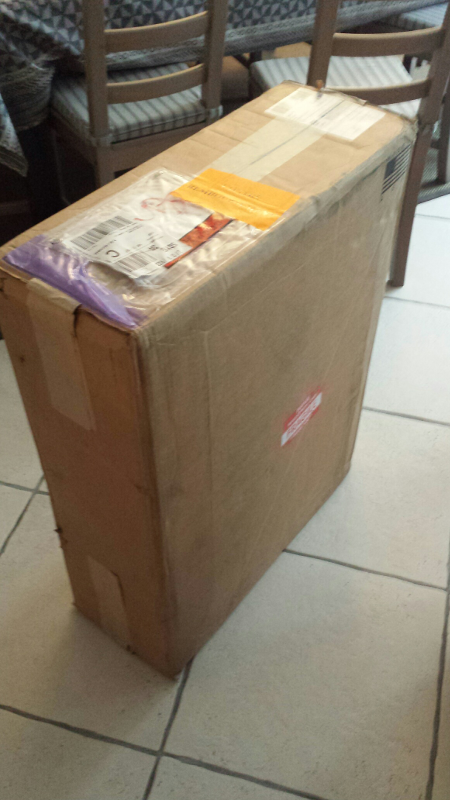 Overall, while I was slightly worried about the long distance shipping, everything came out of the box in perfect condition. 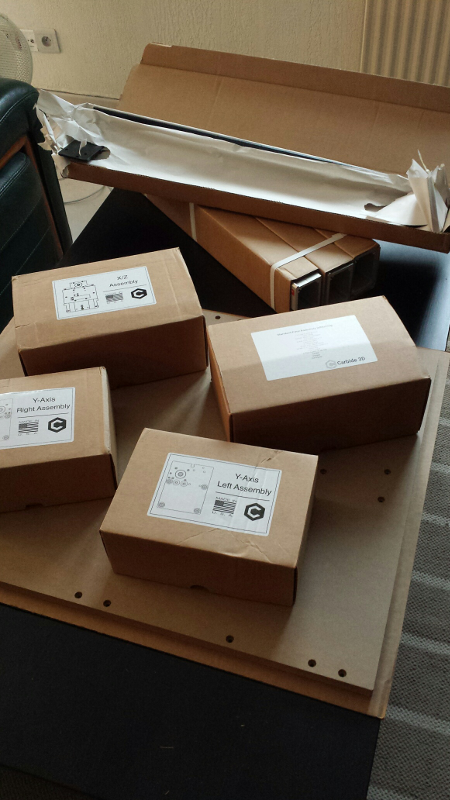 I must also say I got a very good feeling about the quality of all parts: it all looked and felt like quality parts. As I live in the Old World I did not really care that much about “made in the USA” before the purchase, but it clearly shows. 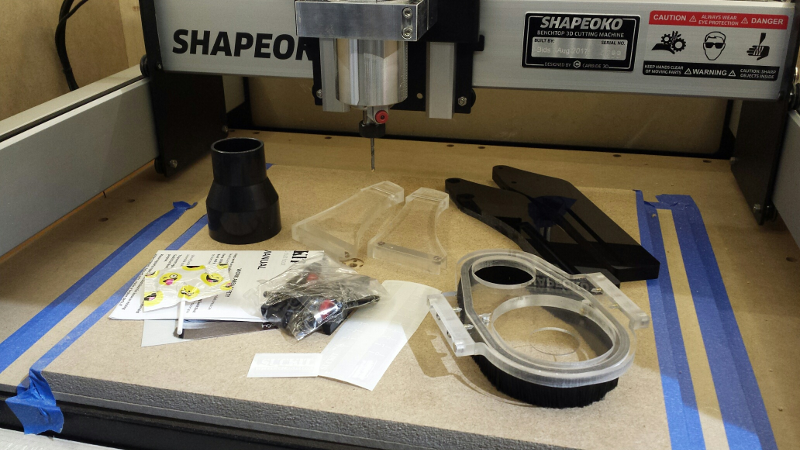 I then assembled the machine, strictly following the online instructions, overall everything went smoothly. I was very glad the X/Y/Z assemblies come pre-assembled, less opportunities for mistakes, and it is still fun to assemble all the rest. the part about rotating the excentric nuts in the correct position BEFORE sliding sub-assemblies onto their associated rails is quite important. 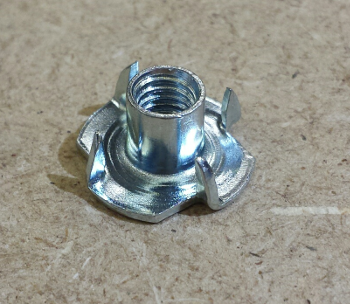 So take time to check this, rotating the excentric nut (clockwise only), ensuring that the V-Wheels are positioned so that the sub-assembly can be slided onto its rail with zero friction (it should even be loose), and then once in place on the rail rotate the excentric nut in small increments, iterating until the V-wheel touches the rail and there is no play, but NOT MORE. The assembly should still slide with no effort on the rail. 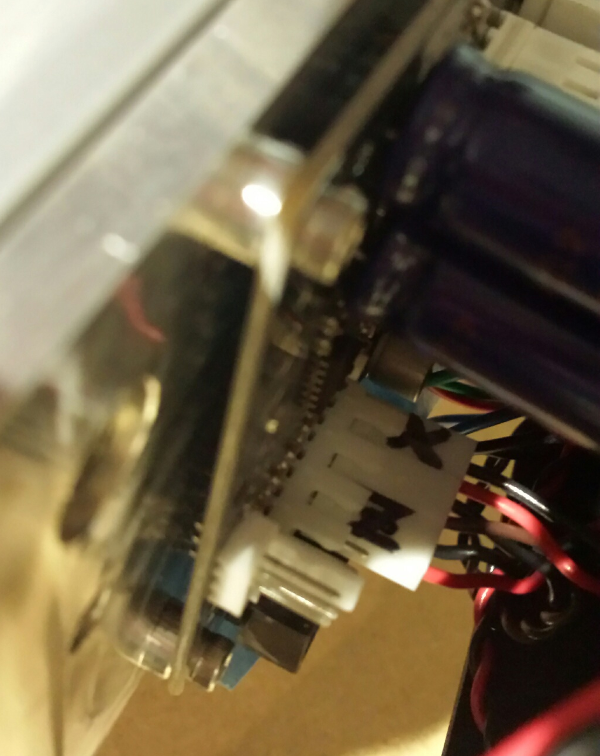 I was cautious to not over-tension the belts, especially since there is an explicit note in the instructions for the Z-axis belt, that excessive tension could damage the Z stepper motor shaft. I erred on the side of too much caution though, the Z movement felt OK when moved by hand, but during the very first controlled motion of the Z-axis, the belt slipped (and the associated noise is quite scary). 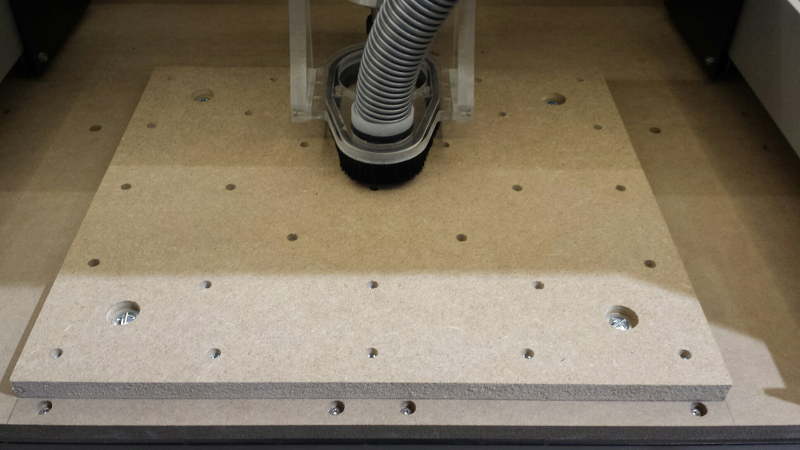 Re-tensioning the Z-belt being a little less convervative fixed the problem. 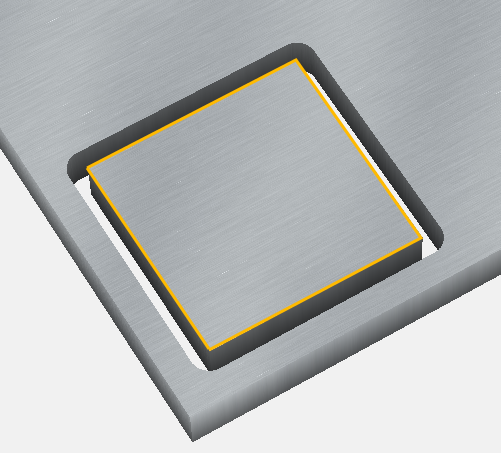 I followed the squaring procedure religiously… but ended up with a quite significant gap (~2mm) between one of the gantry plates, and the rear plate. 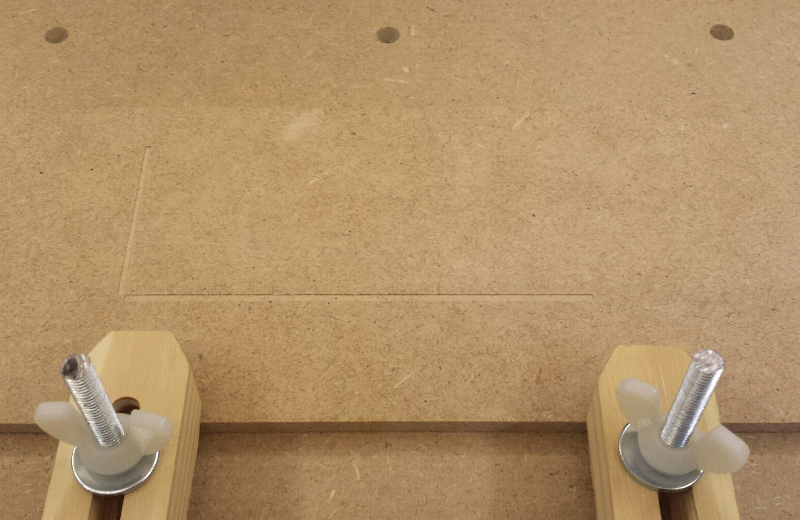 this meant that my gantry was not perfectly perpendicular to the Y axis. 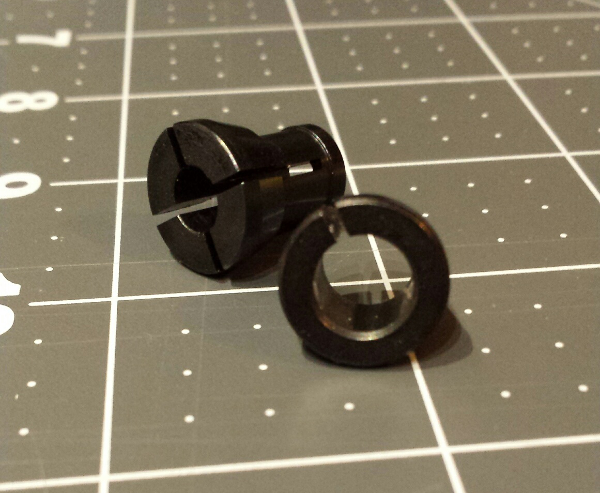 I loosened all screws and re-started the squaring procedure from the top…and ended up with the exact same result. I precisely measured the length of both Y rails, as well as the distance between them both at the front and at the back of the machine, and saw that it was very precisely identical: so the problem did not come from the base frame or Y rails, but from the gantry. 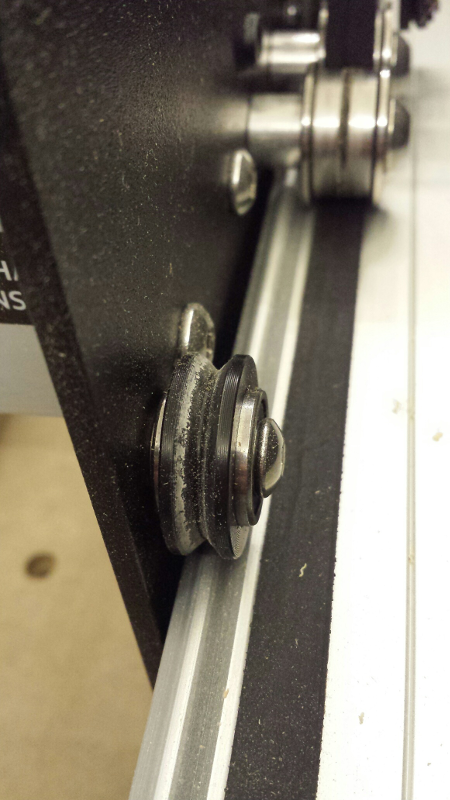 I loosened all gantry plate screws completely, identified which way the gantry was “bent”, used aluminum foil folded over 4 times to make a shim, inserted it at the right place between the gantry rail and the gantry plate, did the same on the other side (with the shim inserted on the opposite side of the gantry), and re-fastened the screws: SUCCESS ! 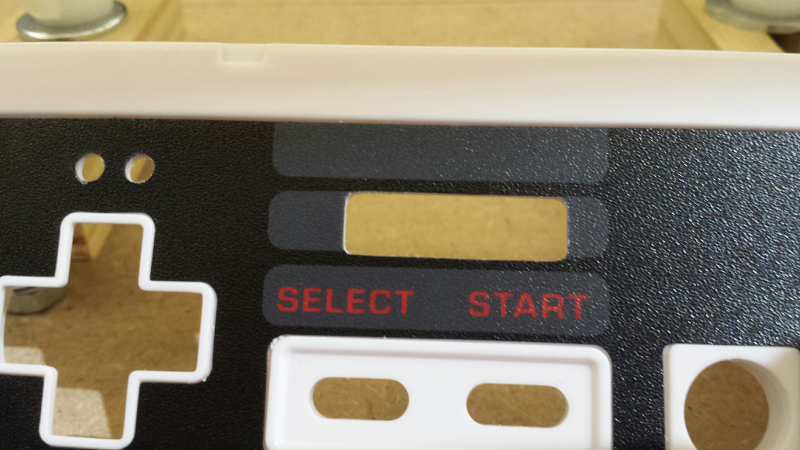 I now had near-perfect contact between gantry plates and front/rear plates, on both sides. 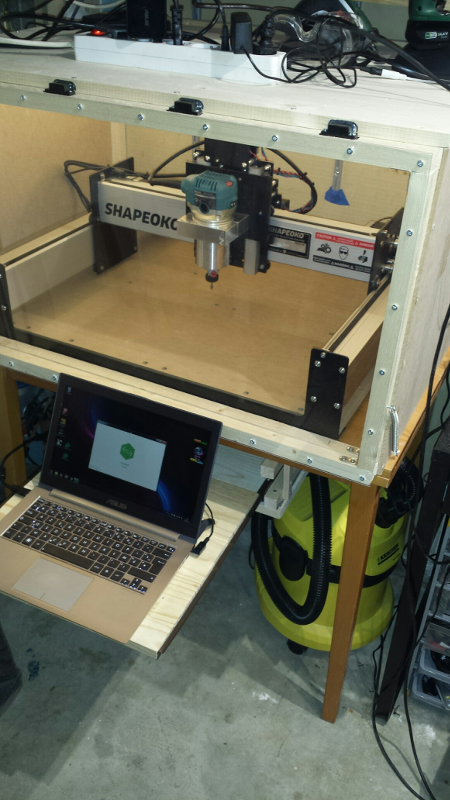 I installed the Shapeoko on an old Ikea kitchen table I had in the garage, that happened to be exactly the right size. But I noted that the table was not stiff enough, and wiggled a bit too much, so I bolted it to the wall: problem solved. 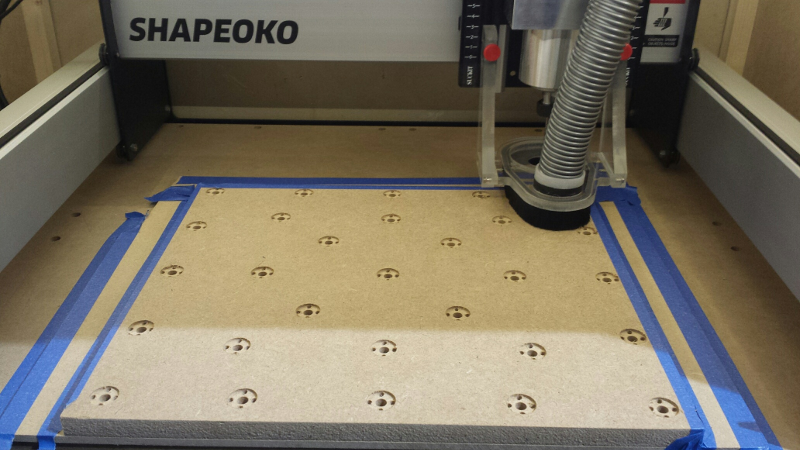 I initially placed a 1 cm rubber mat under the shapeoko (the black kind that usually goes under washing machines to minimize noise/absorb vibration), but this turned to be counterproductive: the shapeoko oscillated slightly during rapid gantry movements, due to the elasticity of the mat. 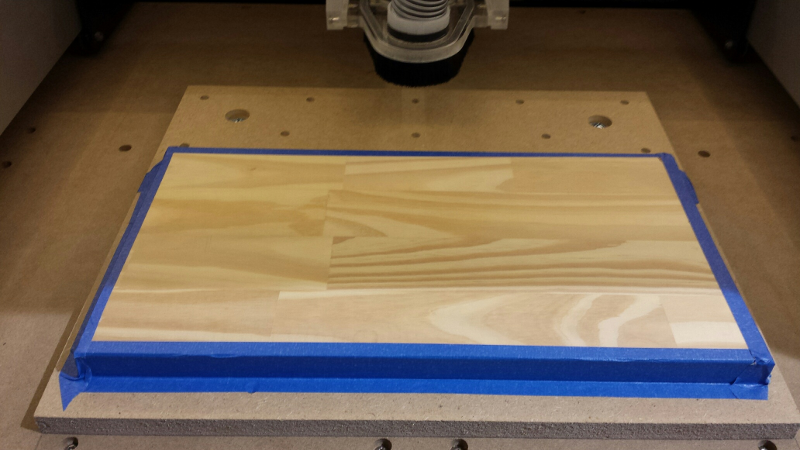 So I removed the mat and let the shapeoko rest directly on the table, adjusted the four feet, and it was stable enough this way. 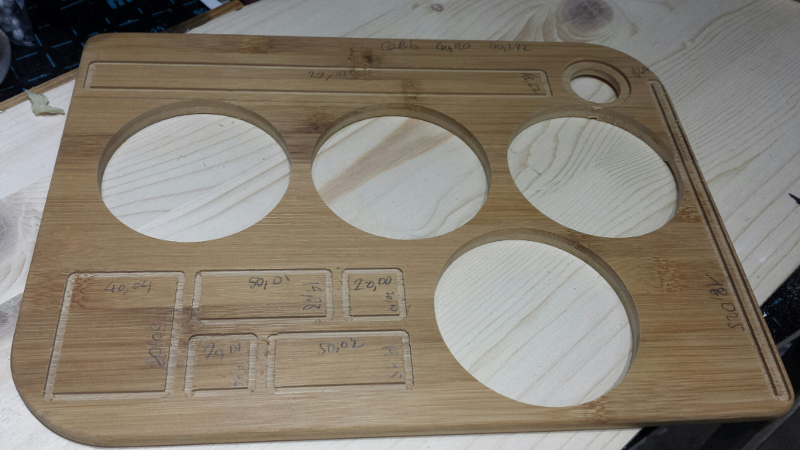 Send the generated G-code to the CNC machine, and let the controller interpret it to perform the appropriate actions. 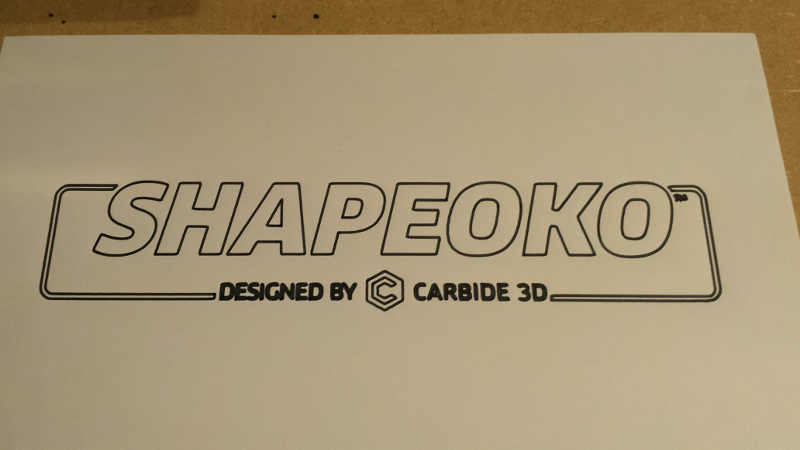 Carbide3D provides a SW called Carbide Create, originally limited to use with the Shapeoko or the Nomad (their other higher-end CNC product), but that can now used for pretty much any CNC as it generates standard G-code. 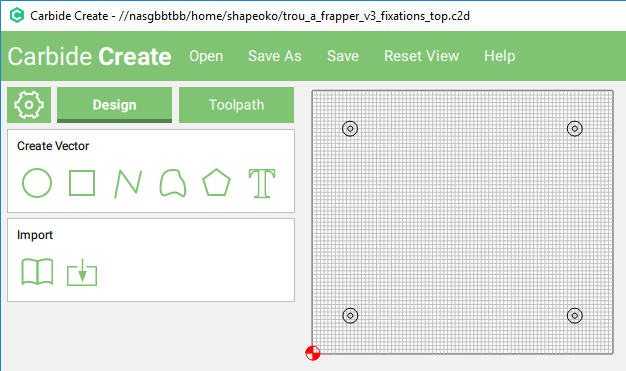 the other popular option at the time of writing is Fusion360 from Autodesk, a full-fledged 3D modeller for makers that embeds a set of CAM features for creating toolpaths and generating G-code, and is free for hobbyists. (many) other specialty CAM software exist, but most are commercial. 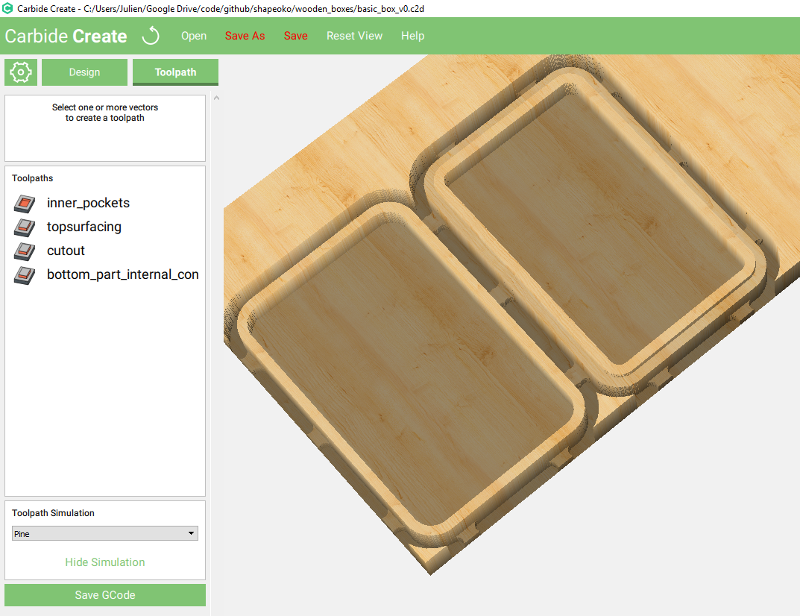 Carbide3D provides a SW called Carbide Motion, a simple interface for Windows and Mac, for interacting with GRBL in the shapeoko controller, to jog the machine into position, load a G-code file, and execute it. MANY alternative GRBL clients exist, of all shapes and forms, like Universal G-Code Sender (UGS), so Linux users may look at that. 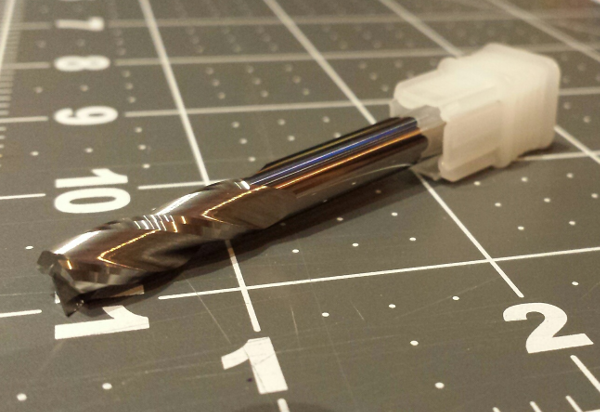 The Carbide SW toolsuite is an excellent way to start, it gets the job done and is very simple to learn. So I went this way, even though I felt that sooner or later I would outgrow it and I would have to learn Fusion360 for advanced projects. 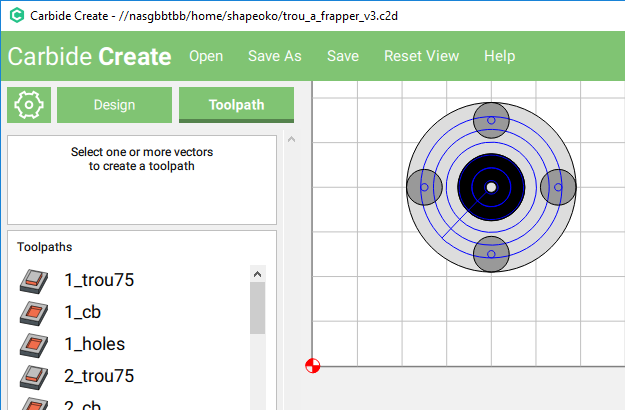 This problem being solved, I followed the excellent video tutorials available on Carbide3D’s site, and was able to create basic programs in no time. 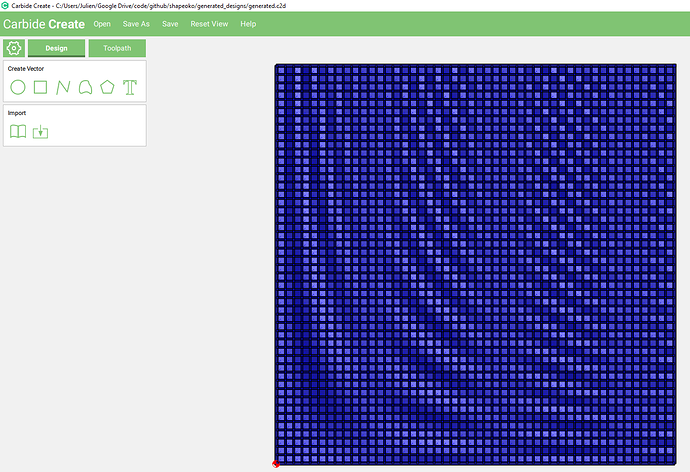 The last step is to generate the G-code program that will be sent to the machine. 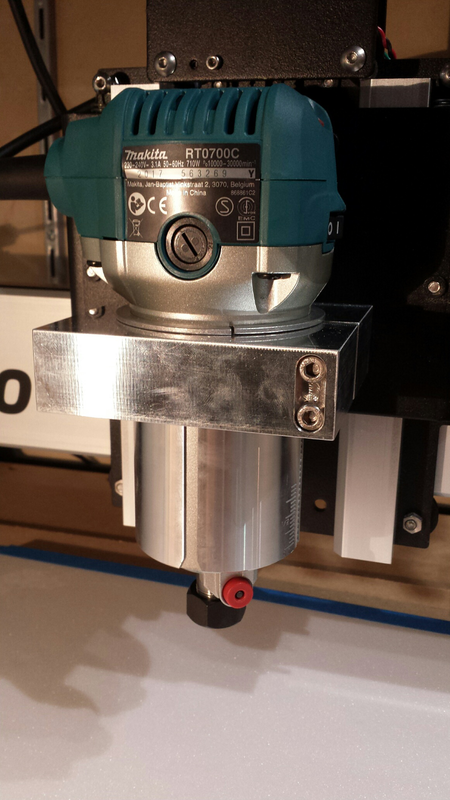 this must first be enabled by sending the $22=1 command to the shapeoko using CM’s MDI menu. Homing will move X/Y/Z axis to the back right corner, until they come in contact with homing switches, then move back by 5mm on each axis. X and Y can be moved fast initially, then reduce the step to precisely position them above the starting point. 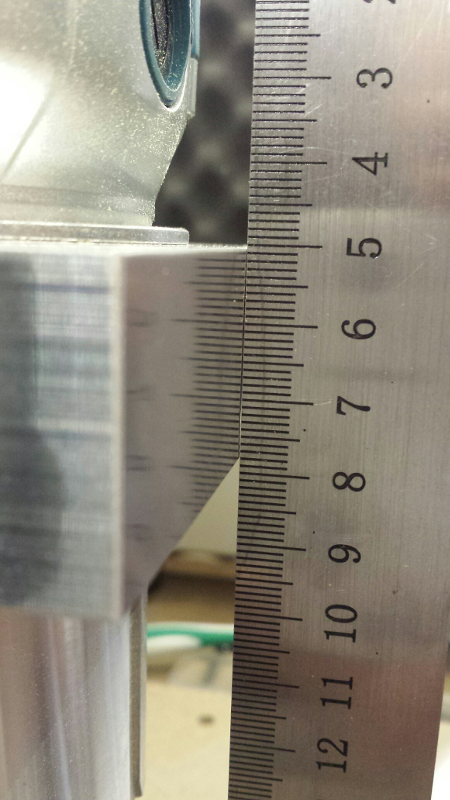 Z needs to be moved slower towards the surface, with very small increments near the end (0.1mm or less), until the tip of the bit/mill/pen mounted on the spindle is just in contact with the surface to be machined. The usual way to achieve this is by sliding a piece of paper back and forth flat on the surface and just under the tip, and moving Z down by one increment, and repeat until you can feel the paper being scratched by the tip. 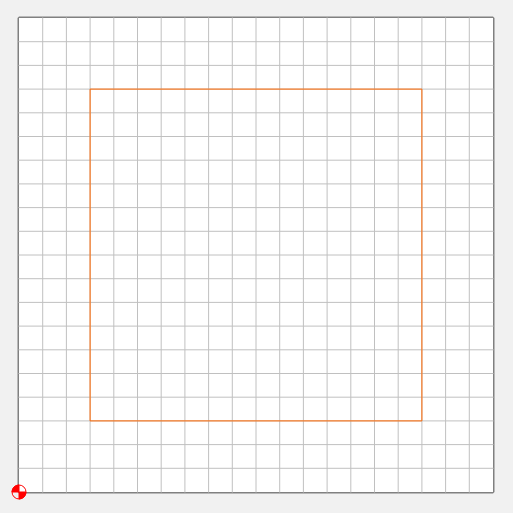 you will only forget to do this once, because it will likely result in crashing the machine: since all executed G-code commands are relative to a predefined zero point, if you forget to (re)set the zero position, the old zero from the previous run will be used, it may be somewhere else completely, and there is a high change your toolpath executed from the wrong starting point will end-up in a collision somewhere. You have been warned ! 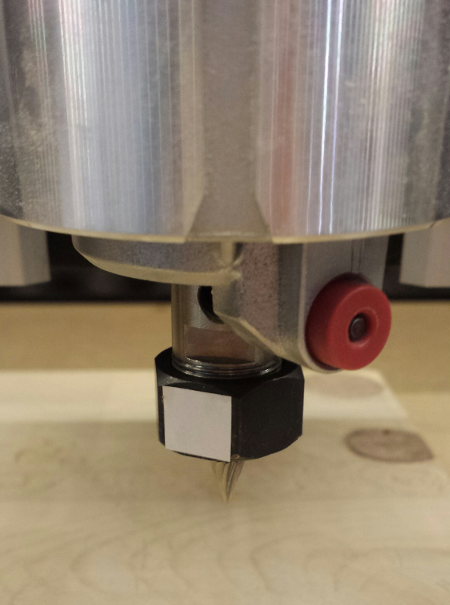 the first thing that will happen is usually that the spindle will back off the surface and wait, this is intended to let the user check/mount the proper endmill and start the router. after all the machine obeys SW commands created by a human being, humans make mistakes all the time: you should ASSUME that your milling program is incorrect, at least the first time you run it. 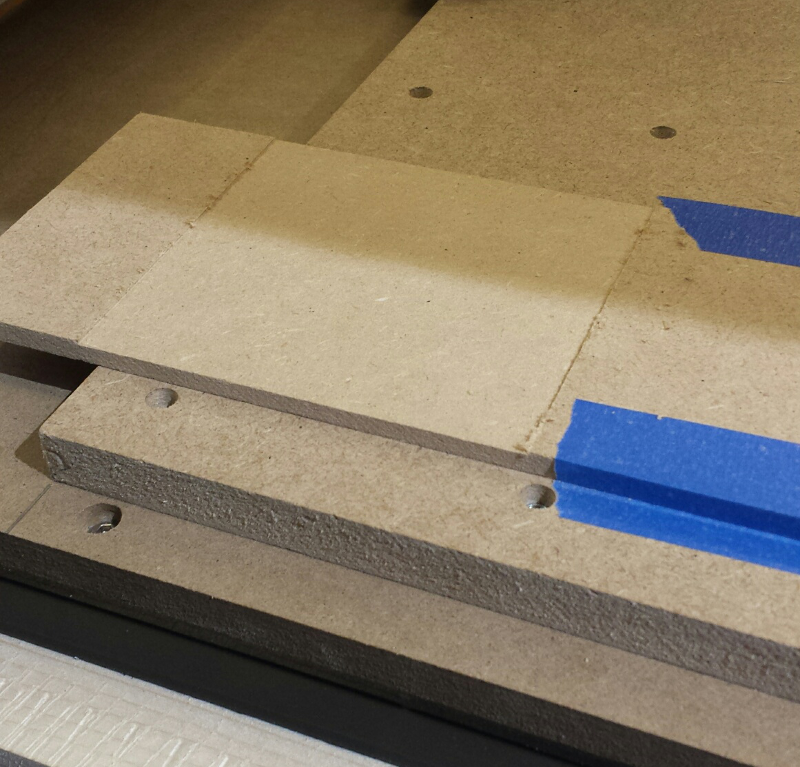 simulating/pre-visualizing the toolpath beforehand helps mitigating this risk, but you can never be 100% sure. 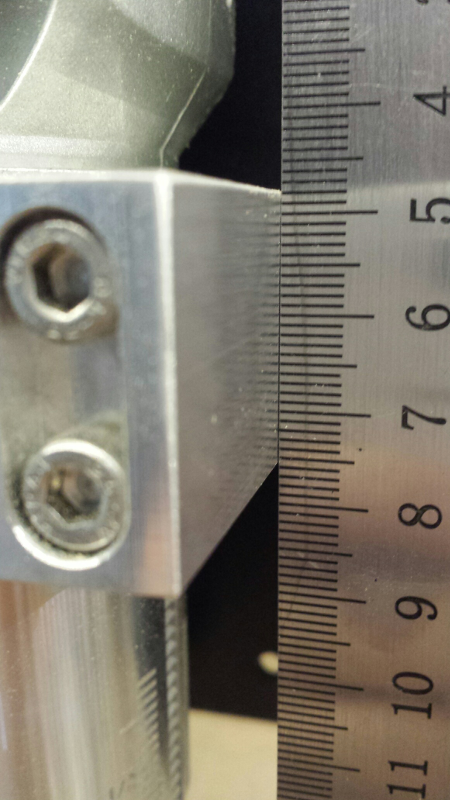 Even if the toolpath is correct, mechanical problems may happen. 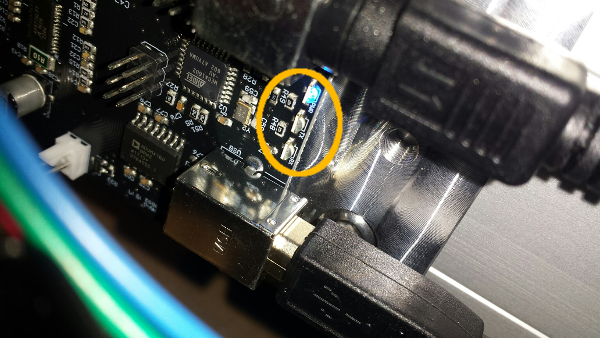 Time for the first power-up: I hooked-up the USB cable to my desktop PC, launched Carbide Motion, tried to connect…and got a Cutter did not respond error. Major bummer. 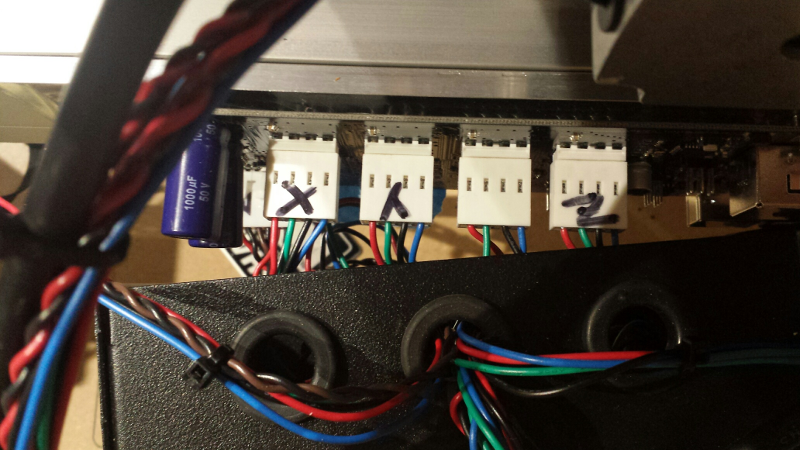 A few hours later after various tests (using a laptop, changing the USB cable, routing it away for other cables, changing the order I turned on the shapeoko versus plugging the USB cable), I unmounted the shroud placed over the controller, to check what was going on in there. 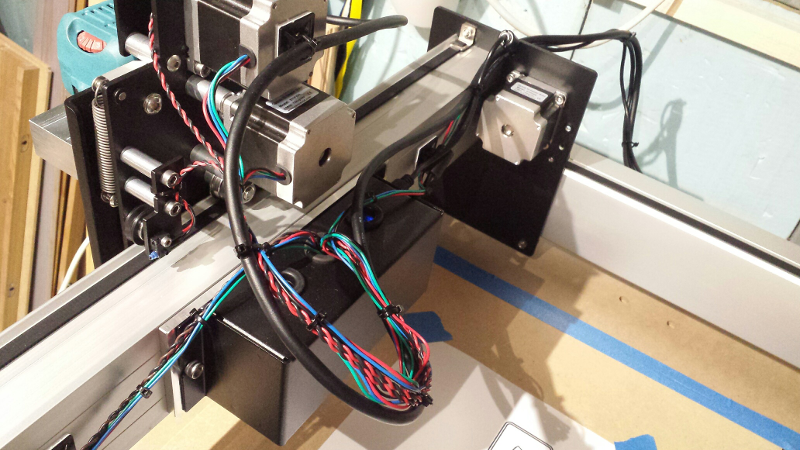 and immediately heard the stepper motors come to life/click in place, after which I was able to successfully connect from Carbide Motion. A few tests later I confirmed that removing R50 fixed the issue, my shapeoko now properly reset and clicked in place at power-up. 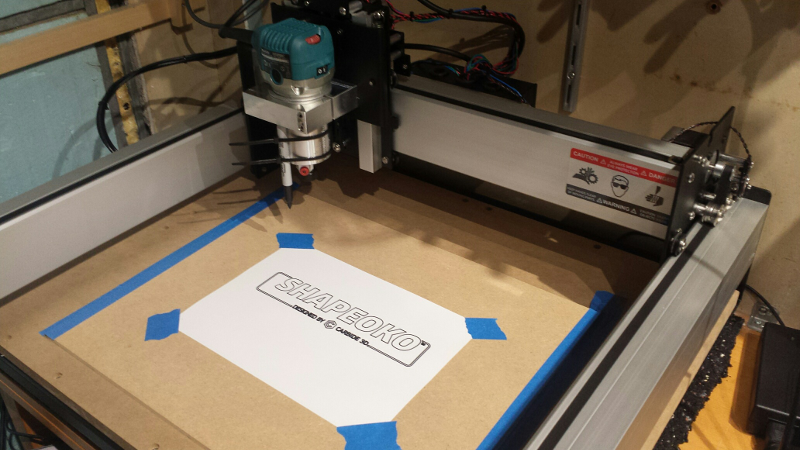 I proceeded to complete the traditional “Hello World” Shapeoko tutorial, which consists in attaching a sharpie marker to the spindle, and running a program that draws the Shapeoko logo. To check the squaring/alignment/calibration of the machine, I created a simple pattern of geometrical shapes of known dimensions. 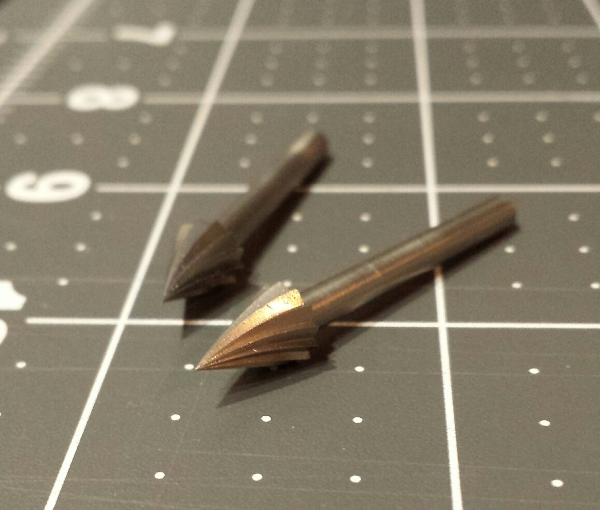 After reading the G-code from the Hello World sample, I saw they were using a “cut depth” of 0.01 inches = 0.254mm. 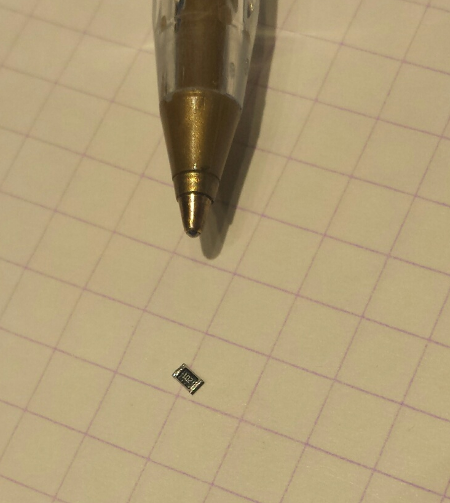 I thought 0.2mm was a bit too much when using a pen which point is not a soft as a Sharpie’s, so I finally used 0.1mm. 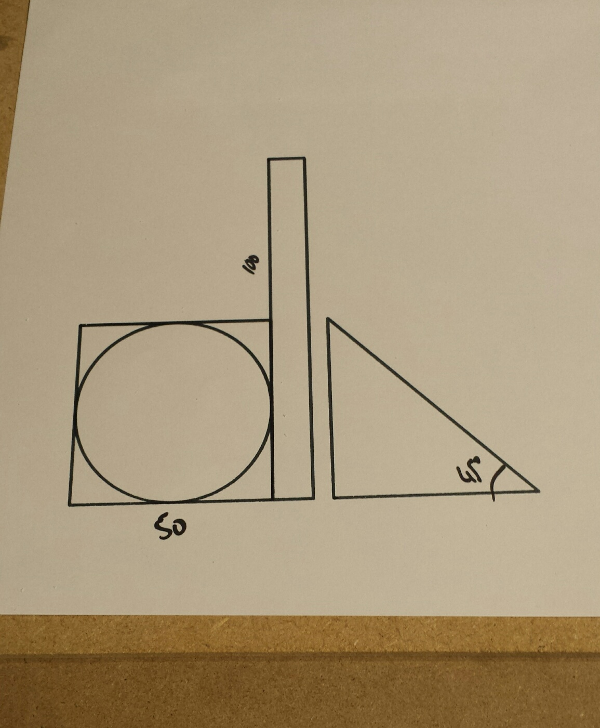 Using a tape and protractor I checked that dimensions were (visually) very close to the ones specified in the model: good enough for my needs at least so far. 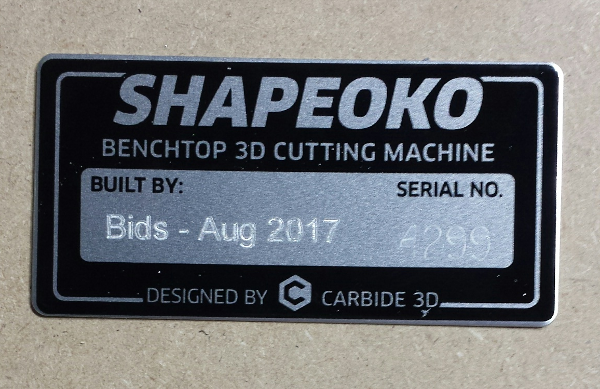 I am not a precision freak (yet), and there are ways to finetune the shapeoko to get high(er) precision, but I will address this later. 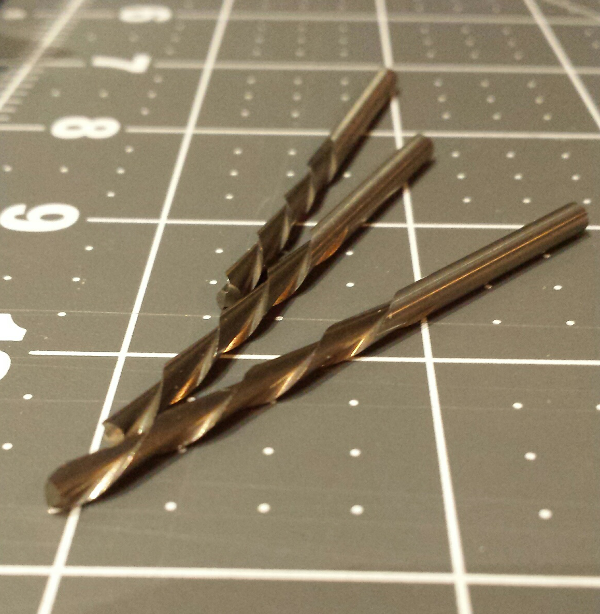 up spiral: the direction of the flute is such that it pulls chips away from the cutting surface, thus is quite efficient at removing chips, but could produce tear out on the material surface. 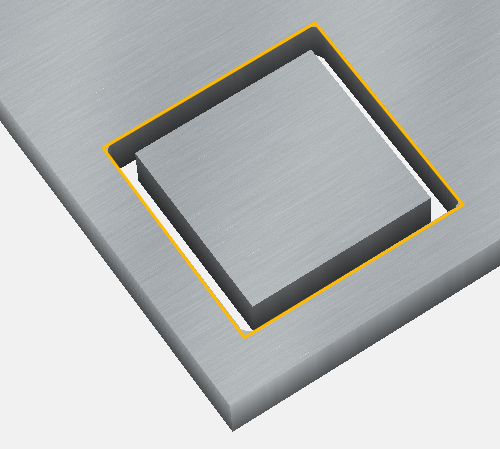 down spiral: pushes chips downward when cutting, so not efficient to remove them from the cutting area, but can reduce tear out on the material, for a better finish. 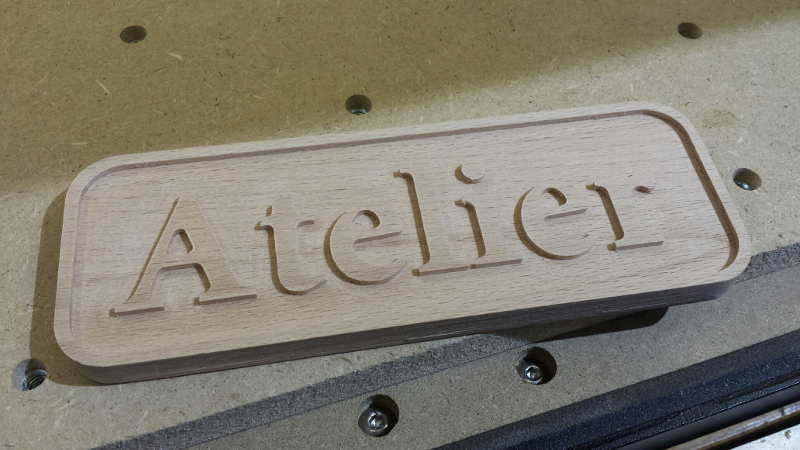 V-bit of a given angle: specialized bit typically used for carving text. whether it is center cutting or not. 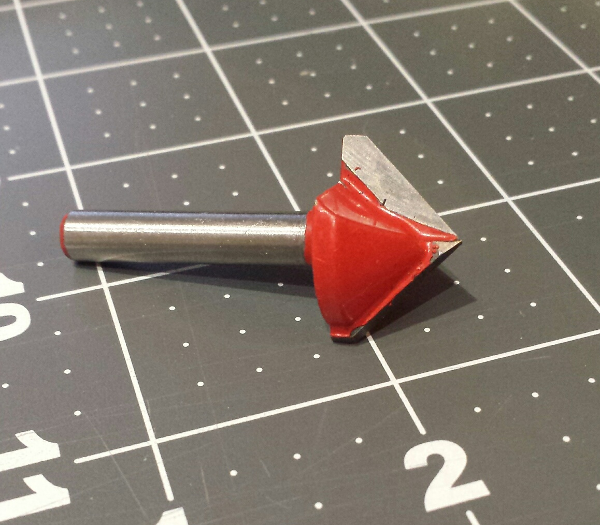 Most are, it means it has the ability to plunge into the material (vertically), like a drill bit does. the length of its cutting part, and its total length. 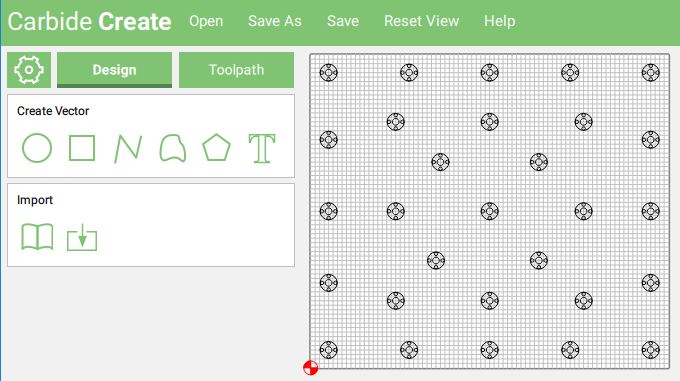 A design usually contains many shapes and their associated toolpaths, but in the end the CAM tool generates a single set of sequential G-code instructions to be run by the machine, so it executes all the toolpaths in sequence. 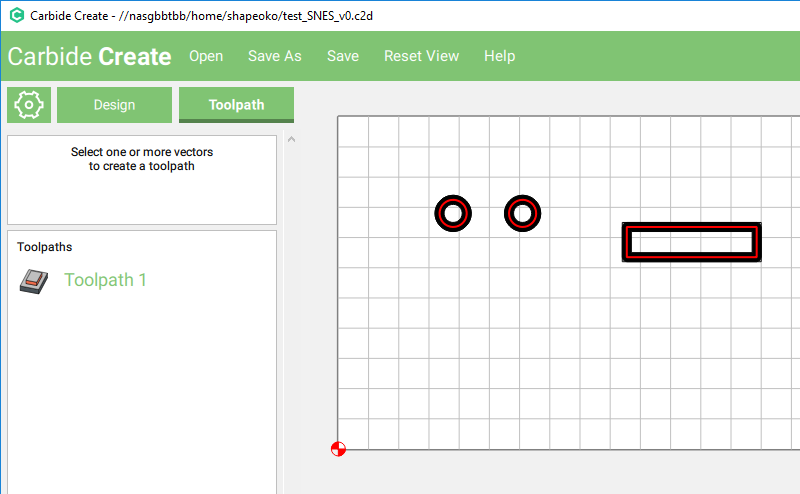 When using a CAM tool like Carbide Create that does not have a preview of the complete toolpath, it is a good idea to check the generated G-code to see what it will do, before loading it in the shapeoko. There are many G-code viewers out there, I like this simple one and just copy/paste the G-code I want to check. Fusion has an integrated preview, which is nice. 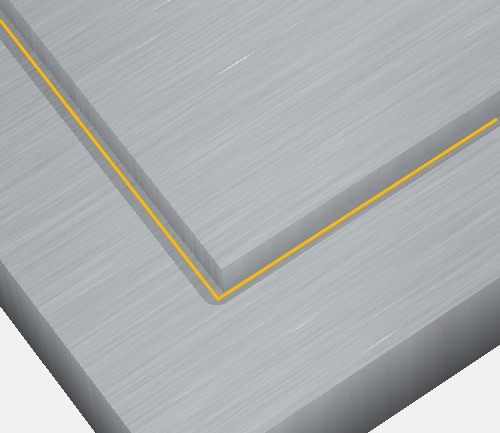 but more importantly, the cutting generates heat on the cutting teeth (and the material) by friction, and the amount of heat that gets removed from the end mill is linked with the thickness of the chip being removed. 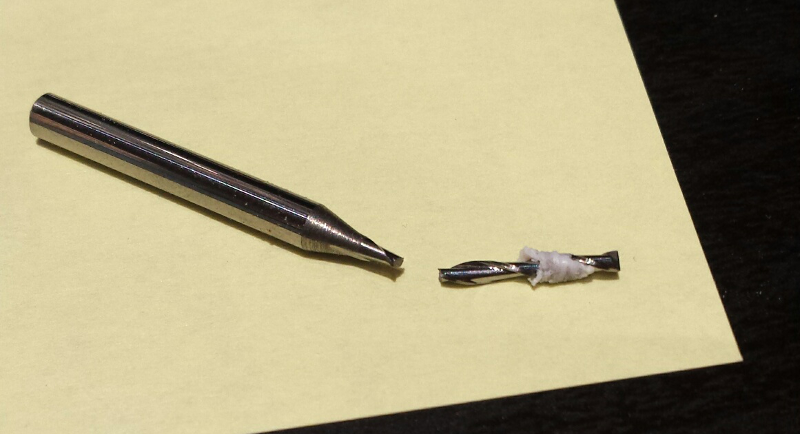 So very thin chips means that almost no heat dissipation occurs, the heat builds up on the endmill, and this quickly ruins it, ending up in poor quality cuts and a damaged tool. A low RPM and high feedrate can lead to excessive force applied on the bit/machine axes/motors, and end up breaking the bit or damaging the machine itself. 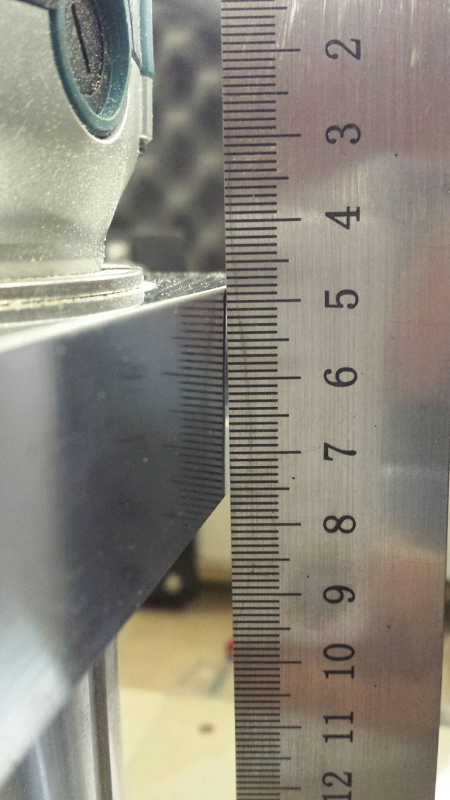 sometimes the endmill diameter gets added in the formula too to include linear speed of the cutting teeth. But anyway, the important thing I think is to understand the dependencies between these variables (i.e. which parameter to vary in what direction to increase or reduce the load or speed), then there are plenty of online and offline tools to compute feeds & speeds for you. 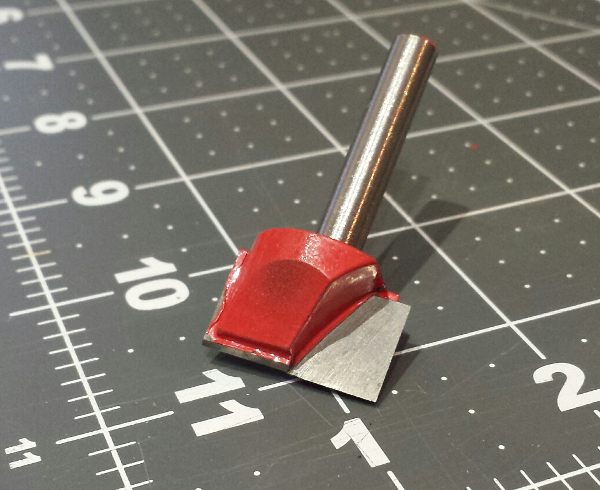 As a beginner, I used what Carbide Create gave me as a starting baseline for a given material & selected endmill. 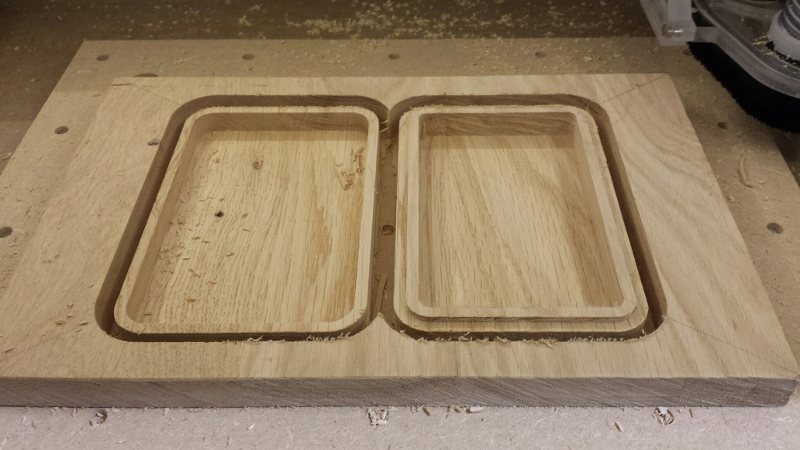 Next step was to start some actual milling ! So far, so good. 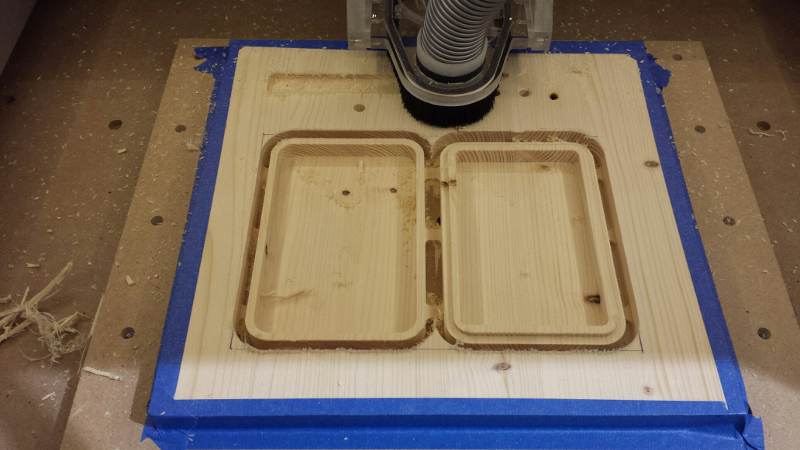 Edges are not very clean, but the intent was not to optimize feeds & speeds on this one. 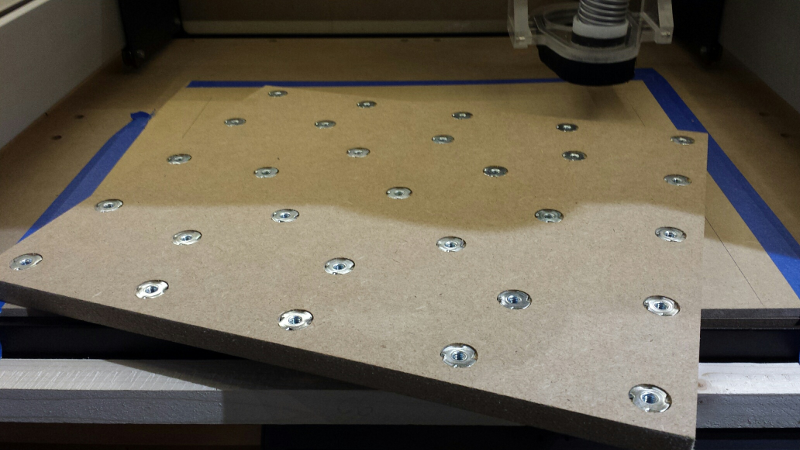 As everyone learns very quickly when starting CNC, milling is very messy (wood/metal chips everywhere!) 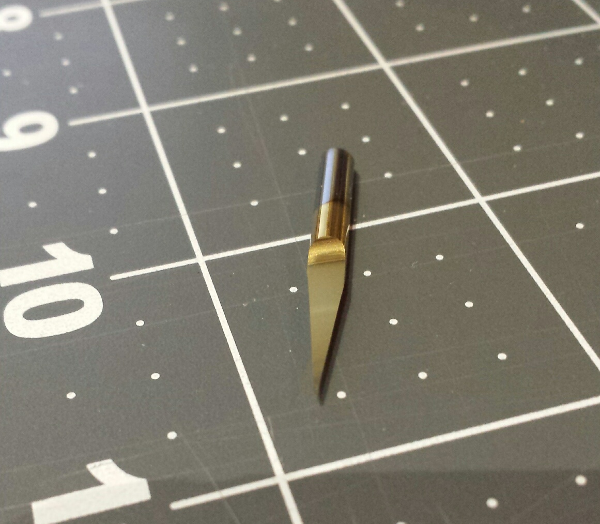 and noisy (router spinning, vacuum cleaner running, and to a minor extent the stepper motors buzzing), not to mention slightly dangerous (who knows where this piece of broken endmill will go flying to…). 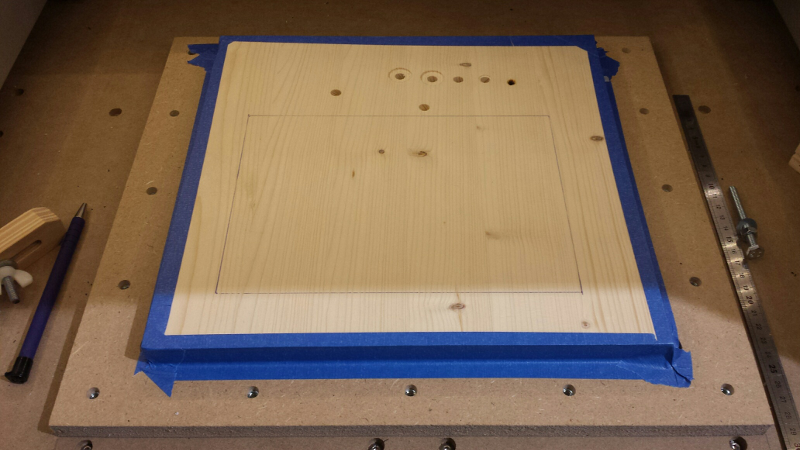 So I built a very basic wooden enclosure, more or less of the the size of the table the shapeoko was resting on, with a plexiglass panel on the front. I hacked a sliding tablet underneath the table to put my laptop, close enough to connect the USB, to have things right in front of me when jogging the machine. 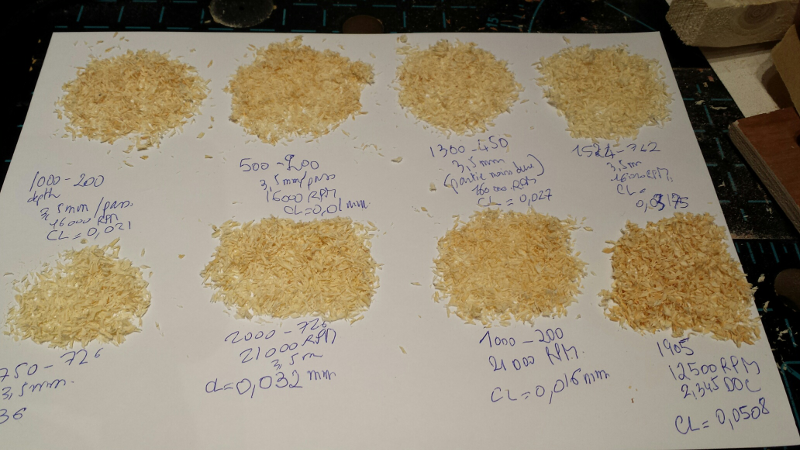 Another thing I realized very quickly is that I would not get away with just vacuuming chips/dust manually after the milling operations, as I initially thought I could do. 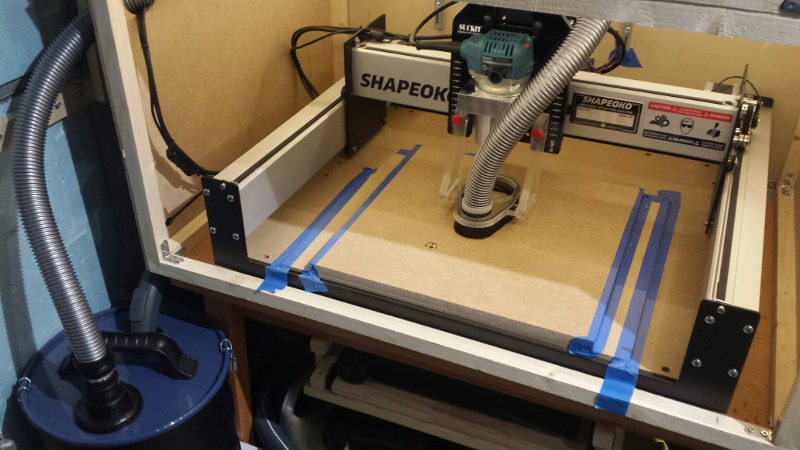 Even small milling operations generate a significant amount of mess, and one quickly ends-up with dust everywhere inside and outside the shapeoko. Also, regularly inhaling MDF dust is a VERY BAD idea (hint: it has the word “Fiber” in it, they might as well call it Medium Density Cancer). 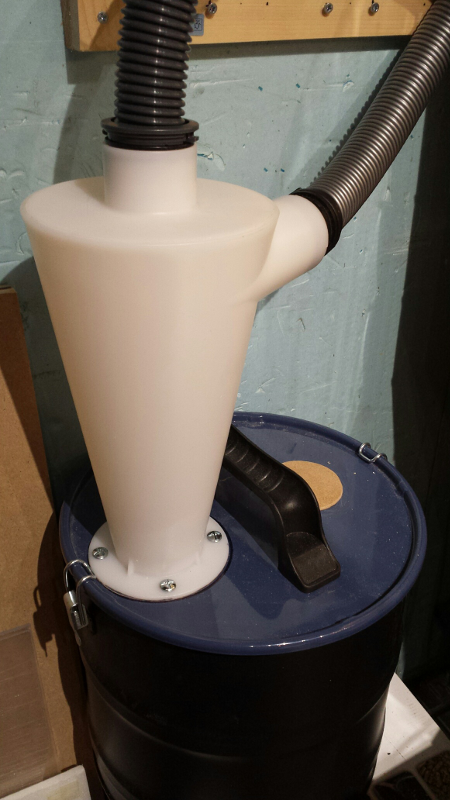 So, I investigated options for installing a permanent vacuuming system. 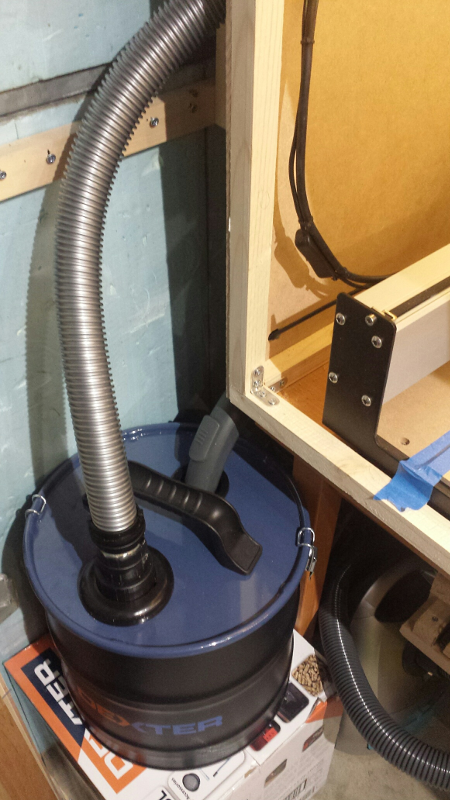 The typical solution is to install a “dust shoe” attached to the spindle, plug a hose in it, and use a vacuum cleaner on the other end. 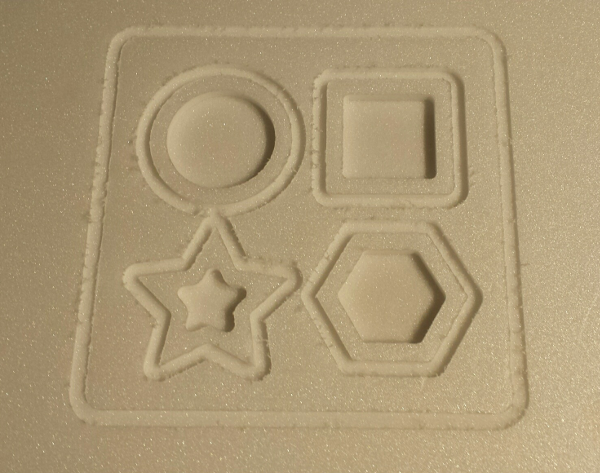 There is always the option of creating a DIY dust shoe, but this time I had neither time nor desire to do it, so I went for buying the Suckit dust boot, that is designed specifically for the Shapeoko3. buying a (very) cheap regular vacuum cleaner with variable power: it turns out there is no need to run it at full power and using the lowest power setting is enough and is much less loud. I had initially used my Karcher dust vacuum cleaner, but it is just way too loud to endure for more than 5 minutes. 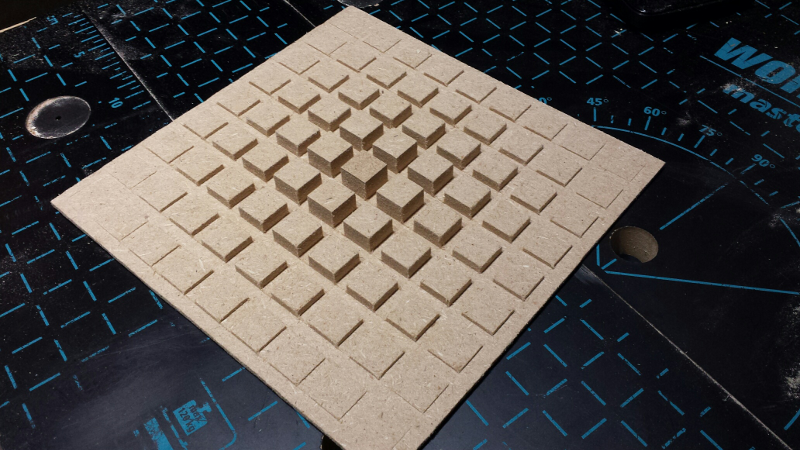 The wasteboard is the flat piece of material that is attached on the bed of the CNC, will allow to secure the object to be milled, but more importantly is there to provide margin between the bottom of the milled stock and the bed of the CNC. 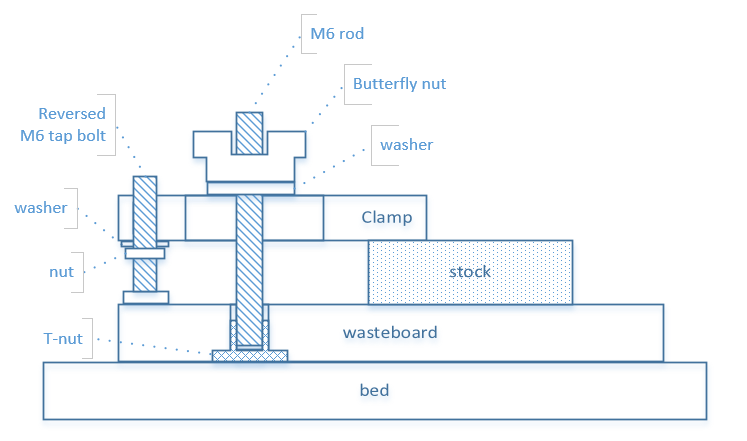 Most milling projects drive the tool down to the max depth of the stock, e.g. 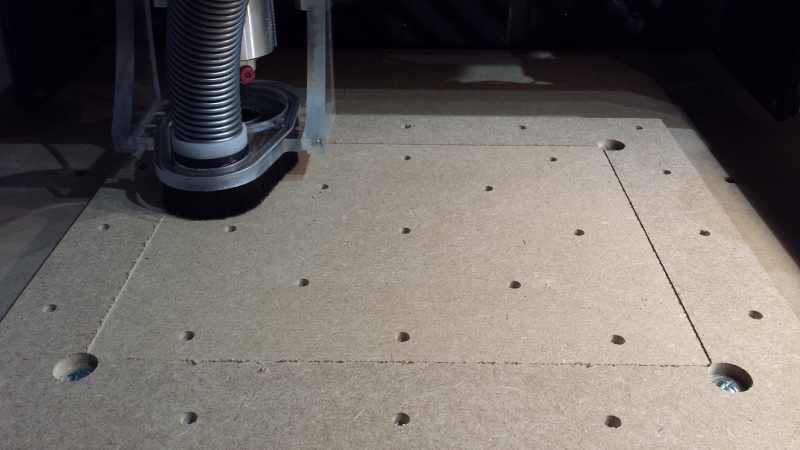 to cut out shapes or mill through-holes, so without a wasteboard, the shapeoko MDF bed itself would be scratched (or ruined, in case of a major error on the depth of the toolpath being executed). The wasteboard on the other can easily be replaced when it is too damaged. 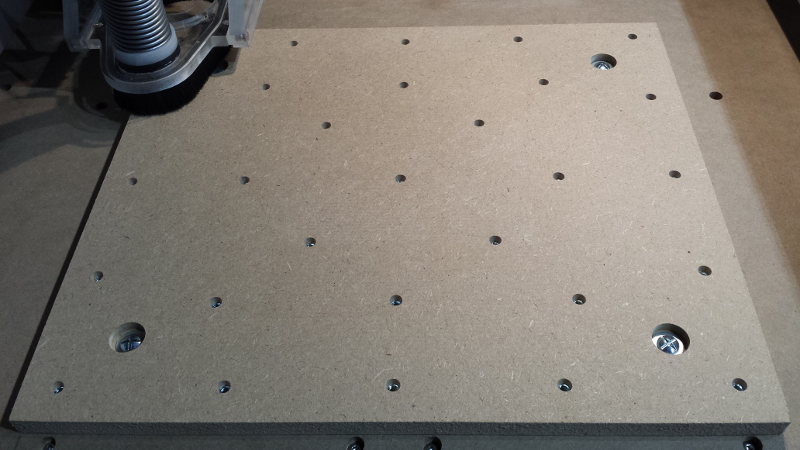 I went for a typical square-ish MDF wasteboard with inserted T-nuts. 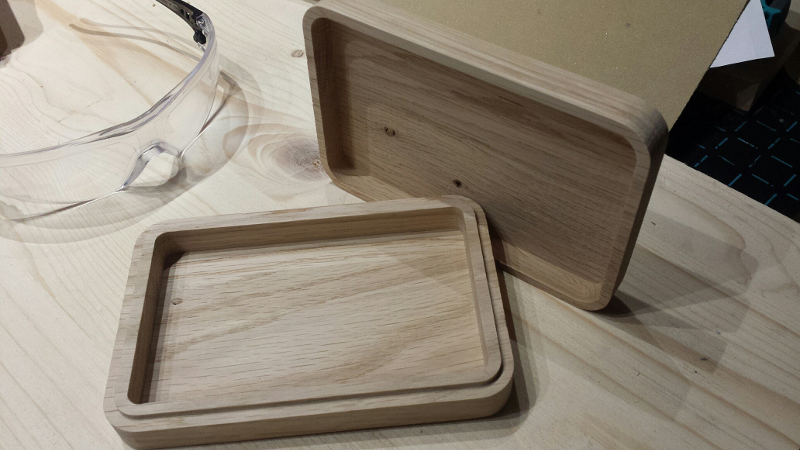 Making it is in itself an excellent exercise to practice designing and running a milling job. 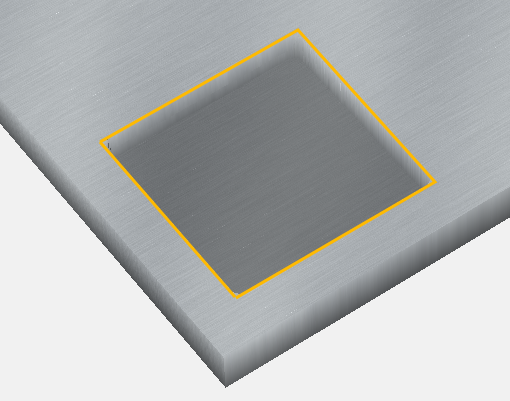 In Carbide Create, I defined a 400mm (width) x 350mm (depth) rectangular stock (I initially went with 400m on both sides to get a nice square, but it turns out that the shapeoko cannot quite reach a Y value of 40cm from the front of the machine). 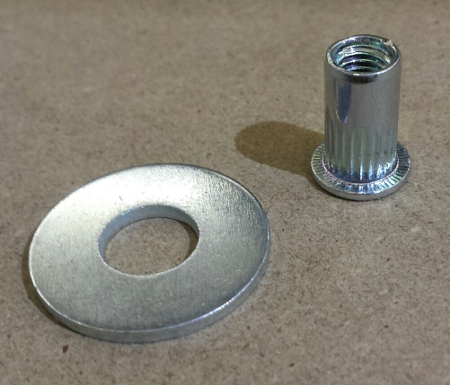 7.5mm diameter through-hole: this would allow to insert the T-nut body, and insert the M6 screw for securing the object from the other side. 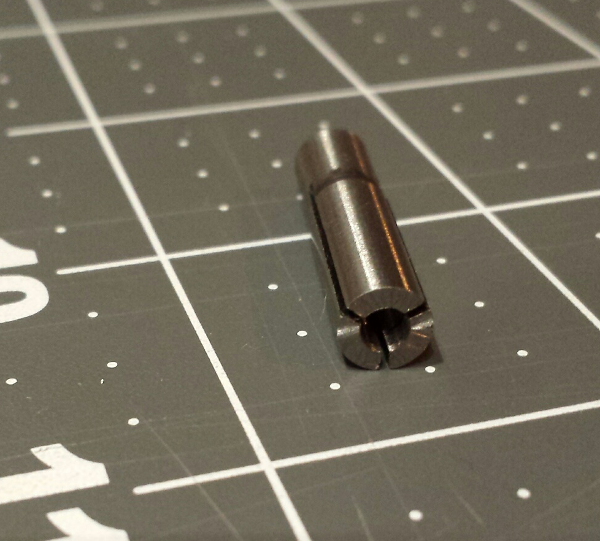 19 mm diameter counterbore, depth=2mm: this would accomodate the head of the T-nut. 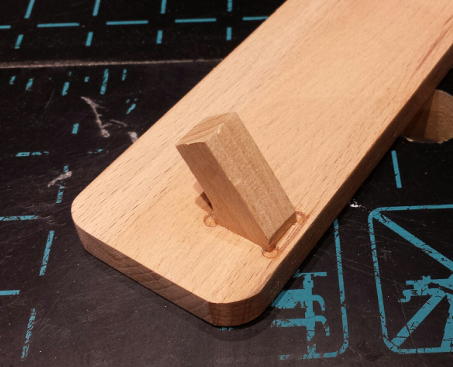 4 x (4mm diameter pocket), depth = 4mm : this would accomodate the four teeth of the T-nut (after a few tests trying to hammer T-nut teeth into the MDF, I chose this approach to have a very clean/flat insertion, without making the MDF bulge due to pushing the teeth in). Of course, creating the 29 x 3 toolpaths manually in CC was very tedious, and silly to do anyway because it meant that any potential change would need to be applied manually at least 29 times. I learned my lesson: next time, I will do this either from a more advanced tool that can optimize toolpaths better, or make a design for a single hole and replay it manually at different positions, through scripting or something. 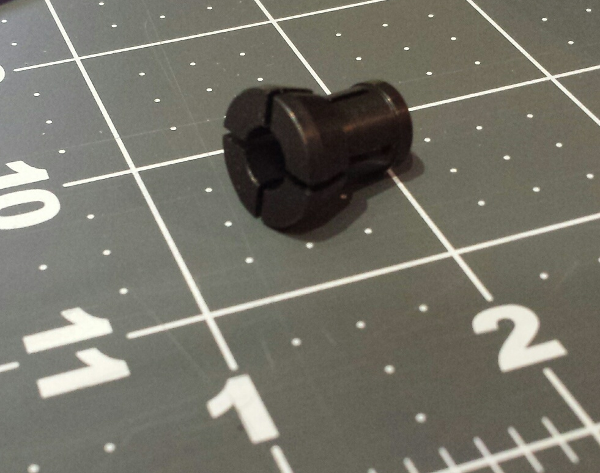 Since this model of T-nut has a very narrow head, I added a washer to have a large surface to pull on. The Carbide Create source file is here. 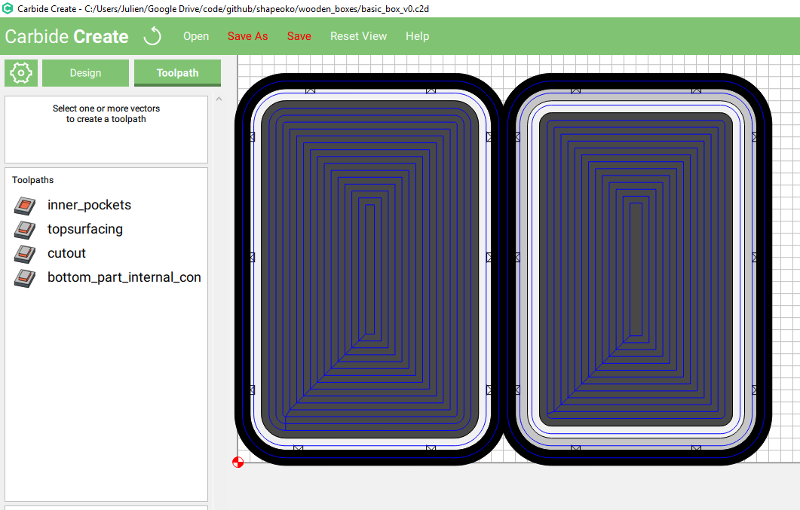 I generated two corresponding G-codes (since total milling time is about 40 minutes, I wanted to execute the first half and second half independently), they are here and here. The Carbide Create source file is here and the generated G-code is here. 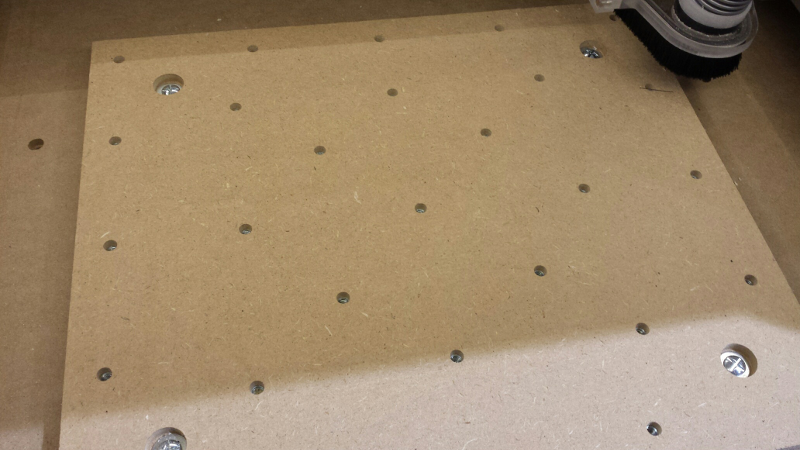 There is approximately 5mm of margin of MDF between the top of the T-nuts and the surface, which should be enough to allow a few resurfacing passes over time. 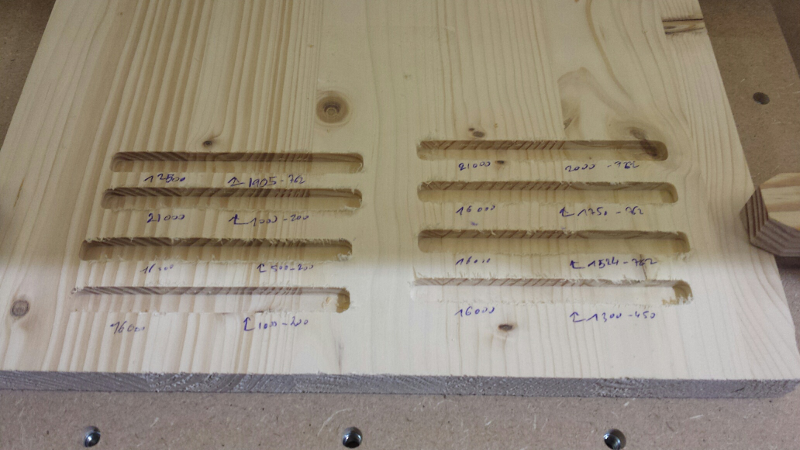 Due to mechanical assembly/imprecisions, and subtle variations in the thickness of the wasteboard, it is quite likely that the surface of the wasteboard is not perfectly parallel to the X/Y plane of the machine, which can result in visible differences in height on different sides of a large milled piece. 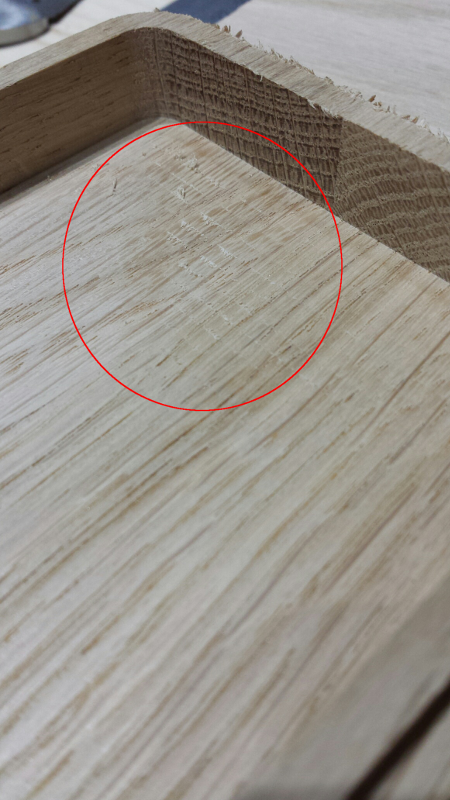 To correct this effect, an easy way is to surface the wasteboard, i.e. 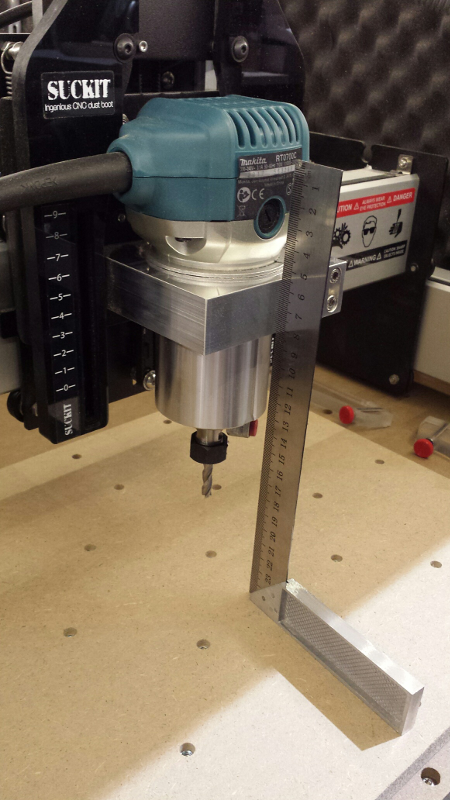 to run a square endmill at a constant (and very shallow) depth across the whole area of the wasteboard: by definition the resulting top surface of the wasteboard will then be perfectly aligned with the X/Y plane of the machine. That looked fine, so I proceeded to apply the same operation to the whole wasteboard. MAJOR bummer, especially since I was being extra careful, and at the time this happened I was nowhere near any mechanical limit, the mill was still in the air, nothing was moving, the router was off, there was absolutely zero reasons for anything to go bad. 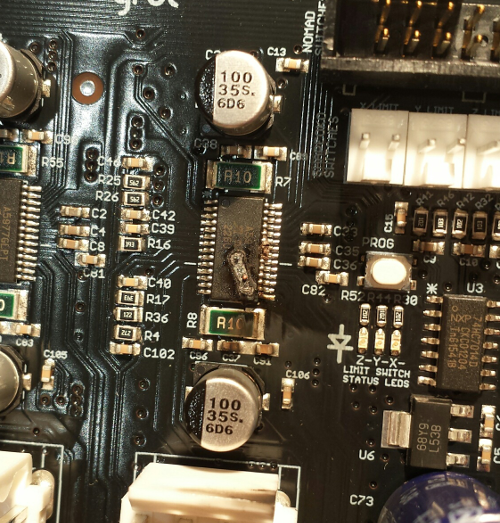 So I’ll never know what happened exactly, but after the initial issue with reset not working on this controller board, I suspect I got a bad board somehow or was just unlucky. Anyway, I contacted Carbide3D’s support, and they shipped a replacement board on the same day, so again very efficient support! While I was waiting for the replacement board, I decided to start learning Fusion360. While I am sure that it will still take hundreds of hours to master it, I was pleasantly surprised to find out that it was not that hard to understand the basic workflow and start creating objects and toolpaths. I watched the 60-minutes worth of introduction videos from Adobe’s web site to get to know the features, and a couple of tutorials later I had a (very) basic understanding of what I was doing, so it was encouraging. After receiving the replacement board I re-assembled it onto the heatsink, after putting a (very) small drop of thermal paste behind each driver chip, and I was good to go. 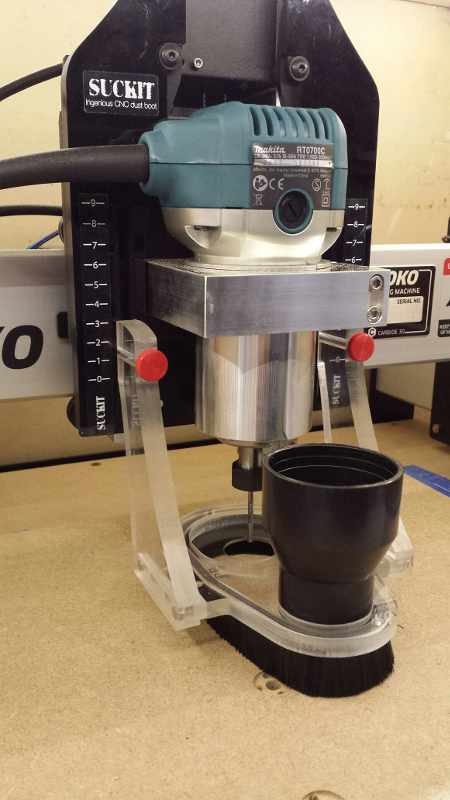 I will only be milling wood & plastics for the foreseable future, so this should be good enough, an extremely sturdy workholding solution is not yet mandatory for me. 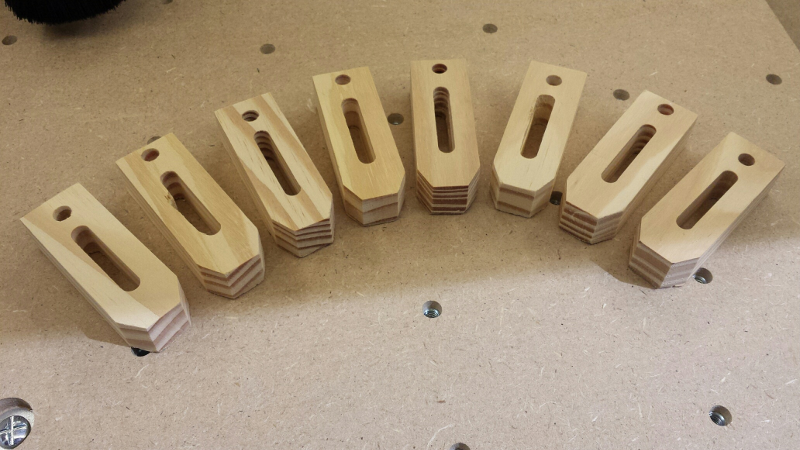 I will probably buy quality clamps somewhere down the road. 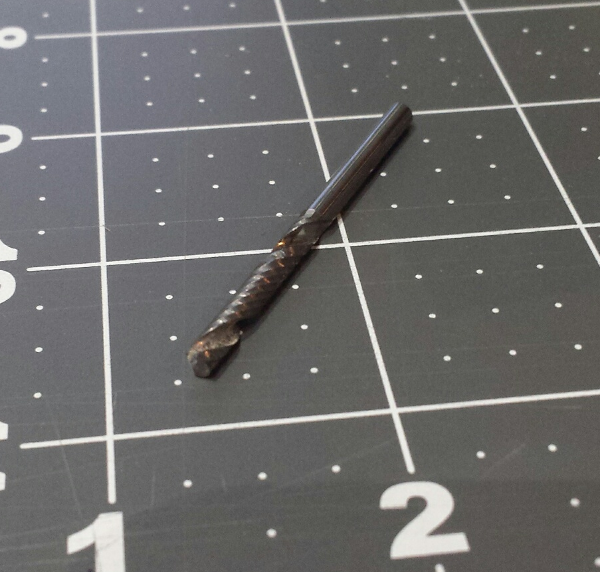 the first time I run the job, I had not pushed the endmill far enough into the collet and/or not fastened it strongly enough, and in the middle of the job the whole thing began to vibrate/chatter, and in the one second it took me to hit the emergency stop, the 1/4” endmill got loose and went out of the collet. 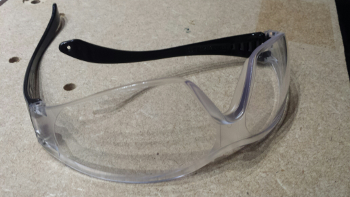 VERY scary stuff, I’m glad I had the dust shoe on and my safety goggles. I secured it better, and with rattled nerves restarted the job: better, but still I did not like the sound the mill made now and then, so I stopped it and reduced the feedrate. 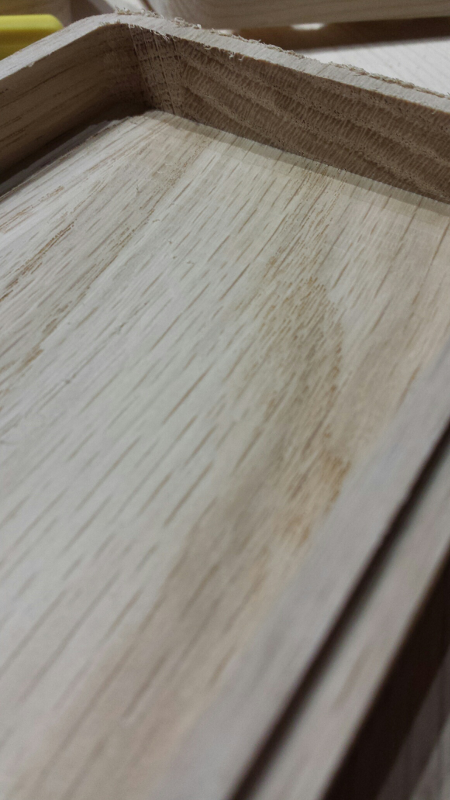 different pieces of wood that look the same can have very different hardness. start with conservative chipload setting, do some trial runs, and raise slowly. this is when I first considered buying G-wizard or equivalent to kickstart the process with reasonably good values for a given material and endmill. 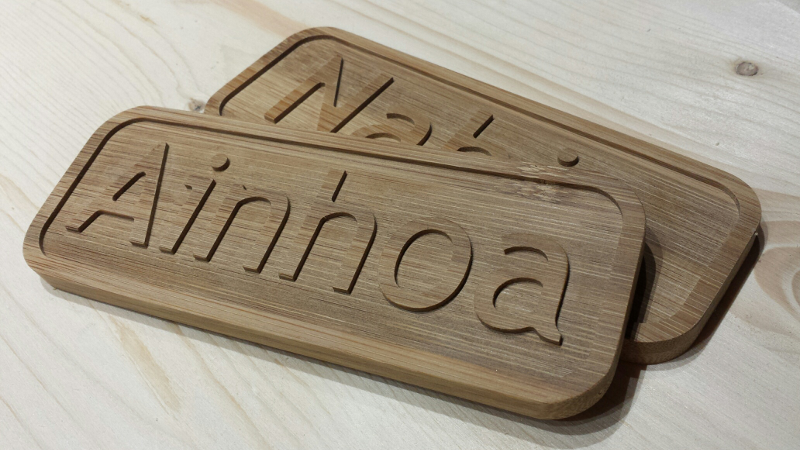 The bottom of the carving is not perfectly clean, but considering this was a first try, good enough. 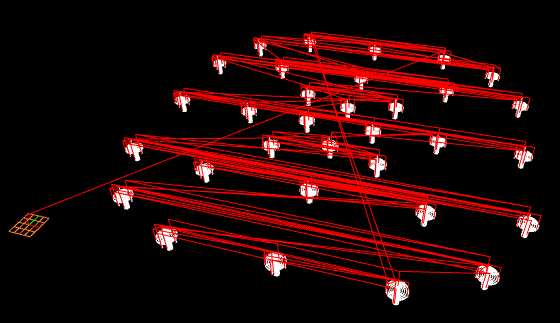 All the CC project files and generated G-codes are available here. 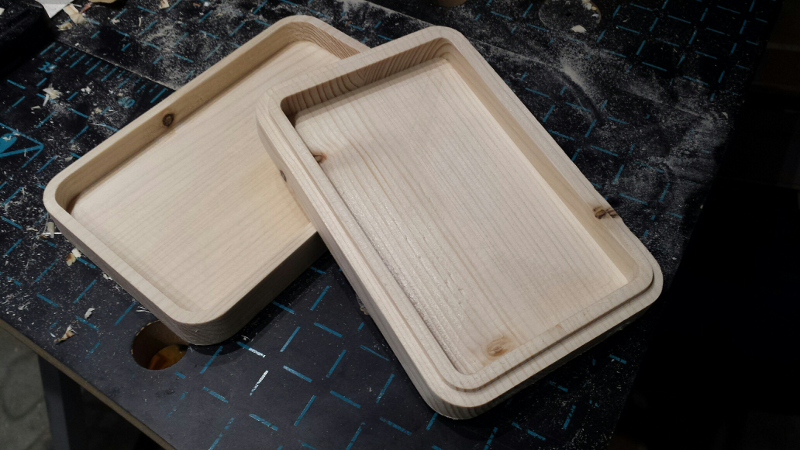 This usecase corresponds to 20% aggressiveness, which seems like a fair setting, considering the shapeoko’s limitation, and to be safe. 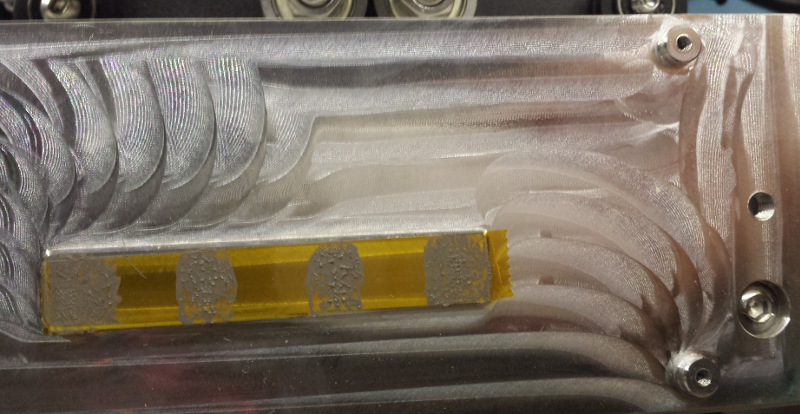 chipload at 0.05mm looks the best: nice chips; and low chatter/vibration during the cut. low chipload/feedrate can be bad: I had read about the possible overheating effects when using too small values, but had not anticipated that going too slow could also produce harsher cuts and more chatter. 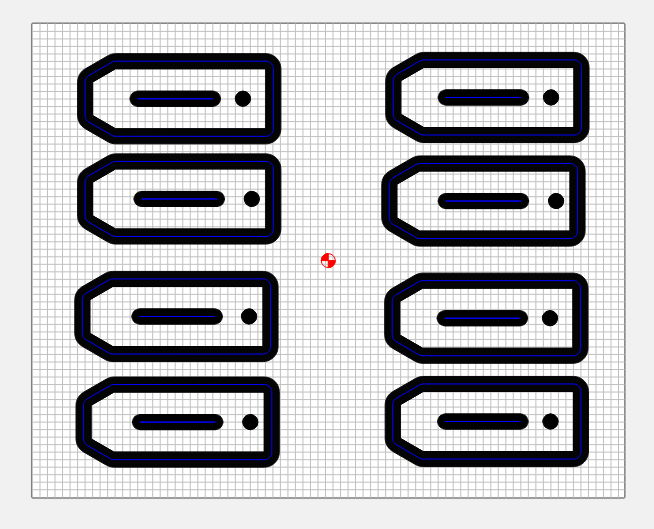 Good enough, but I obviously did a mistake while measuring dimensions to align the display slot. 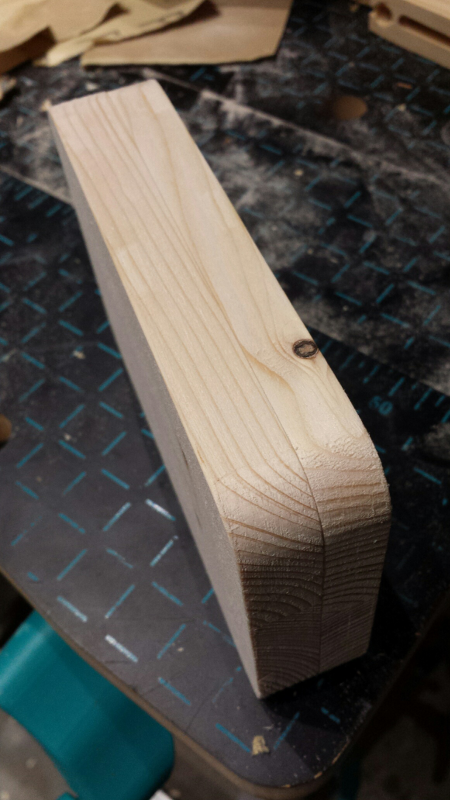 I used a caliper to measure the thickness of the stock, it happened to not be very uniform, I entered the max value I measured in CC. 28 minutes later, the job was finished. I had to pause the job a few times, since large chunks of pine had accumulated in the corner of the dust shoe, and after a while the vacuuming was not good enough. 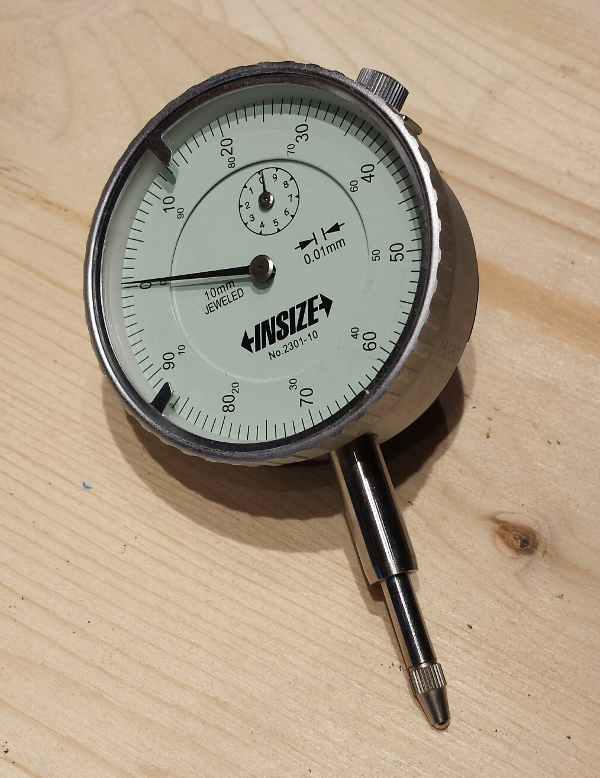 And was happy to see that the two part fitted just right: so even my uncalibrated machine did a very decent job already. When milling fast in pine in the direction of the grain, the endmill has a tendency to rip long thin strips of wood instead of individual chips, which can accumulate in the dust shoe and cause trouble. I should try with a slightly lower feedrate to see if this still happens, and/or try a downcut endmill to see if the effect is the same. 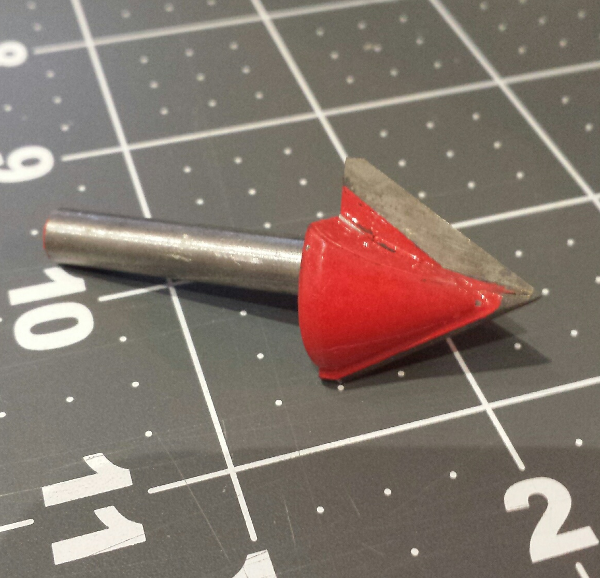 Pine + upcut endmill = lots of manual clean-up afterwards. 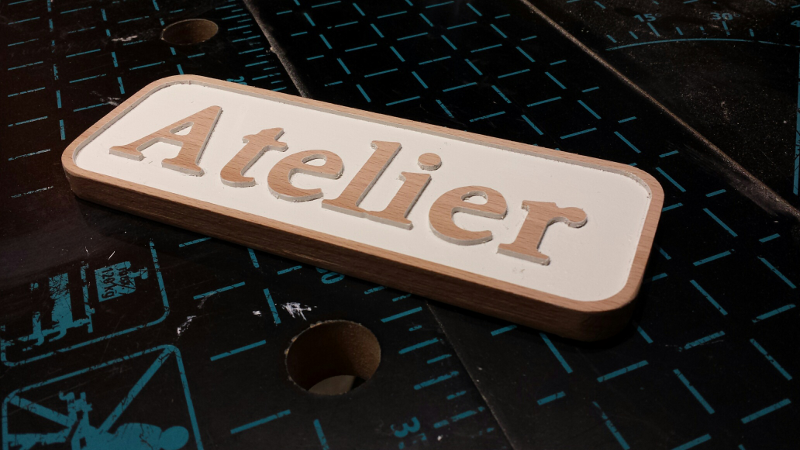 For this next case, I wanted to give a try to milling hard(er) wood, and use the opportunity to build small plaques for friends. 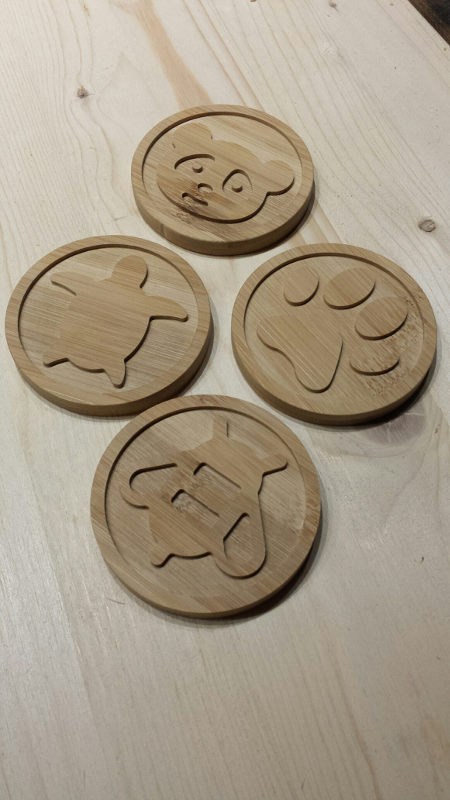 I found a Beech wood cutting board at a nearby store, and decided to use it as stock to cut two small plaques. 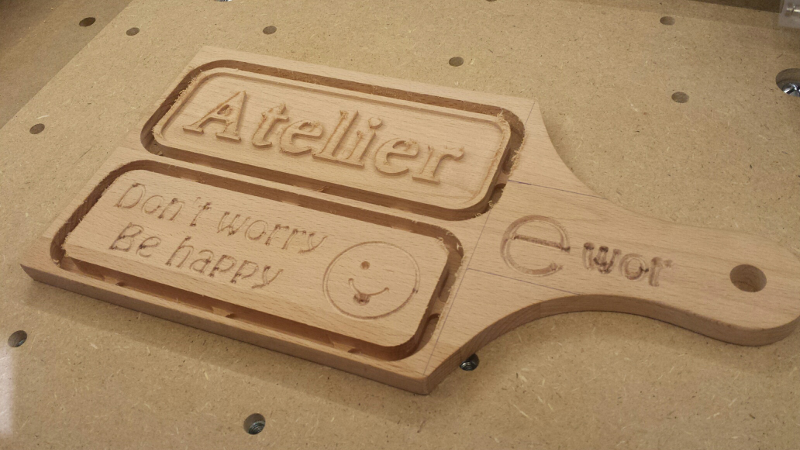 The text and sign were milled using a V-carve toolpath, and an outside contour toolpath was used to cut the plaques from the stock. 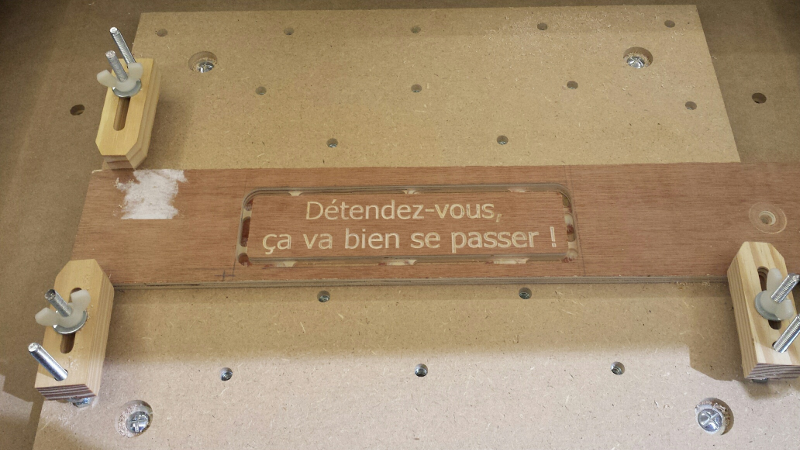 I used (strong) double-sided tape to hold the stock in place, and even for hard wood like this it worked remarkably well. I was a bit scared of the feedrate value CC produced for the outline cut, and reduced the depth of cut to be on the safe side. 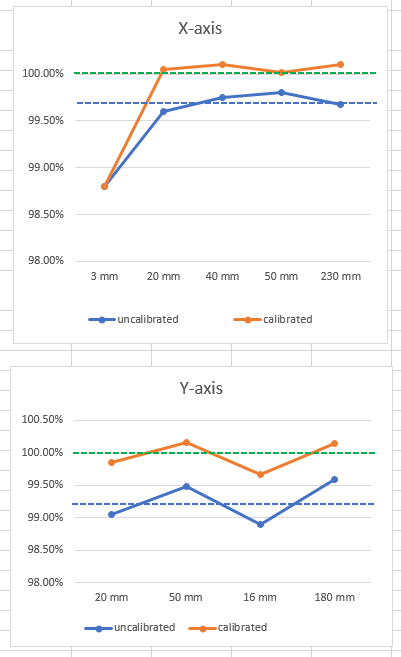 The cut was quite smooth at that feedrate, so I may try pushing the DOC a bit further next time. 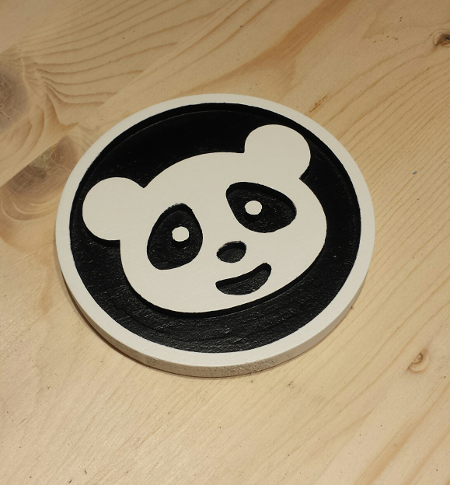 I messed up the painting part in the process, but anyway I got a chance to experiment with two-tone design, and for a door tag this turned out to be good enough. Even though I felt the feedrate was relatively high already, I suspect it was not high enough, and the darker spots are probably due to rubbing of the V-bit for a bit too long at that place. I spray-painted it white, then applied masking tape over the areas that were to remain white, cut the masking tape flush on the borders, and spray-painted it black. This turned out to be more messy than expected, and the black/white frontiers are irregular, so the ends results looks a bit “meh”. I actually liked it better raw in fact. 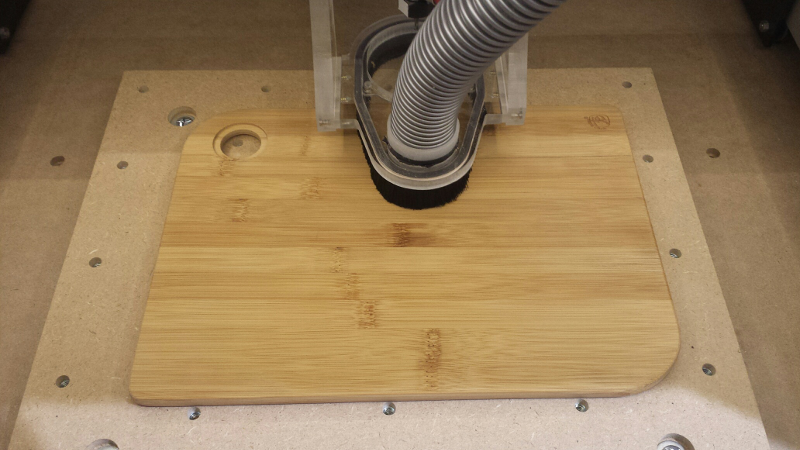 surprisingly, milling Beech or Bamboo turned out to be less eventful than milling pine. I started trusting CC and G-wizard scary-high recommanded feedrates, and used DOC as a much better way to keep it safe. I need to work on my painting skills…a lot. 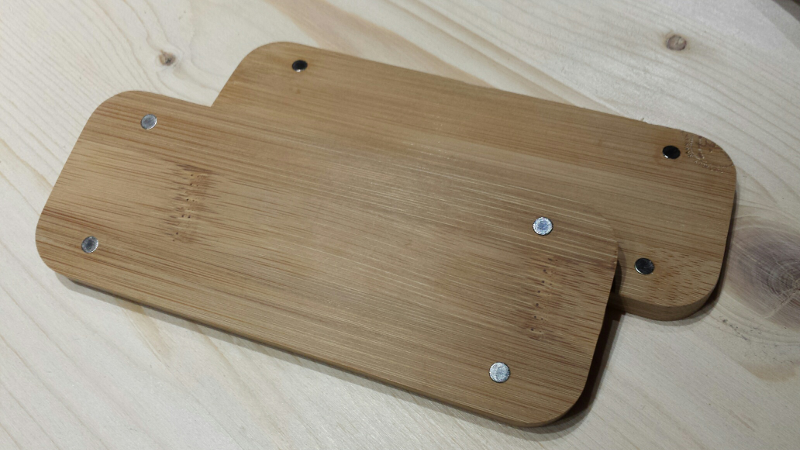 bamboo is easy, gives very clean-looking edges, with very little sanding required. 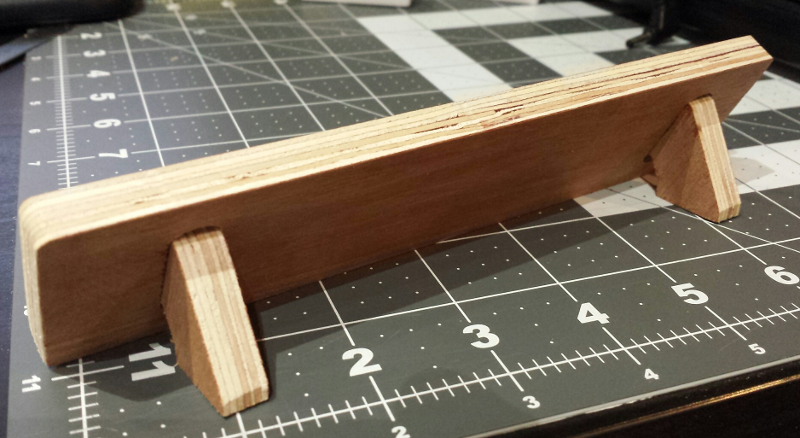 but bamboo sticks less than some other woods, so a little rough pre-sanding before using the tape is good. 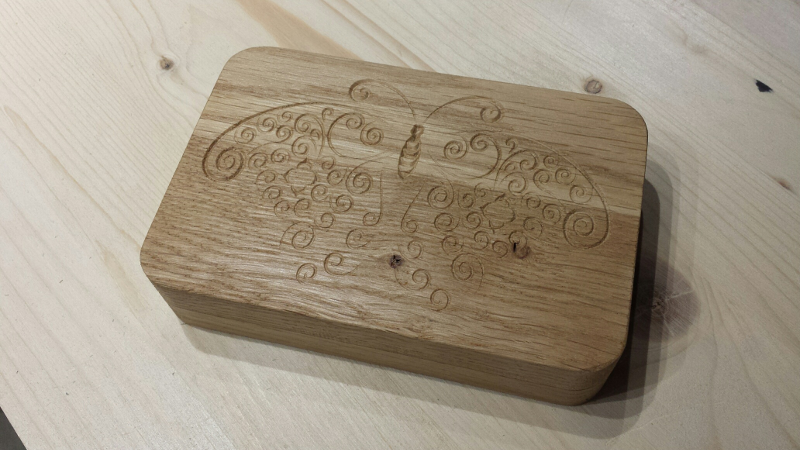 I had another go at the basic wooden box, this time with oak, and fixing a few design issues (e.g. 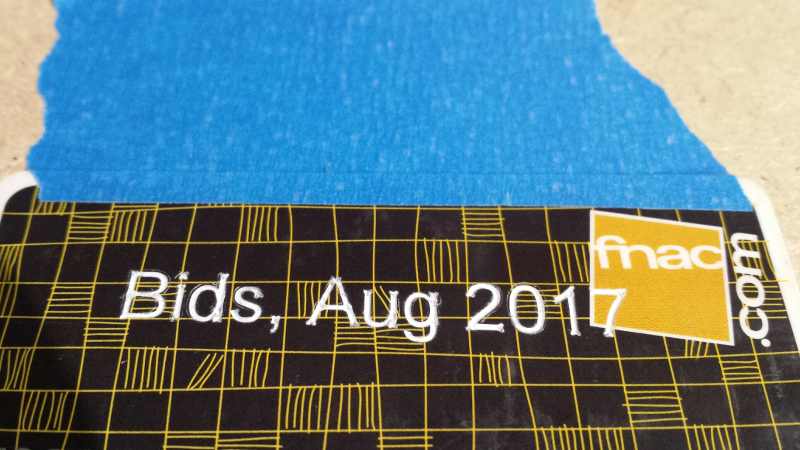 the cover was initially thicker than the bottom part). The modified project is here. 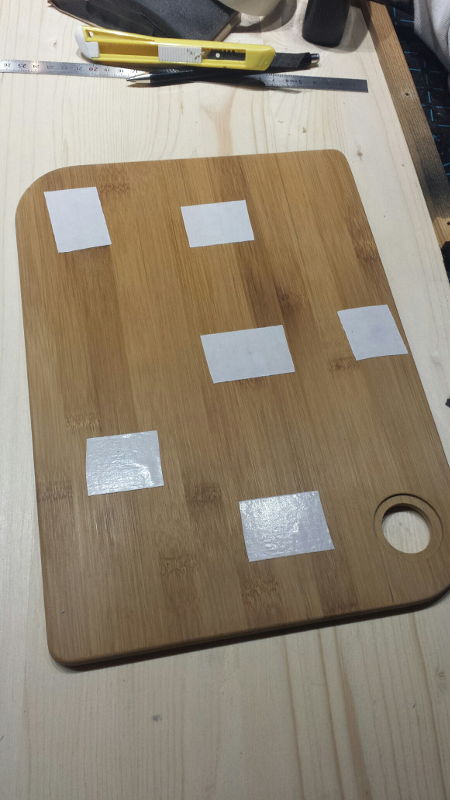 Since this job would sure produce a LOT of chips given the size of the pockets, I needed to have the dust shoe in place, and this does not work too well with clamps, so I figured I would try double-sided tape (yes, on oak). 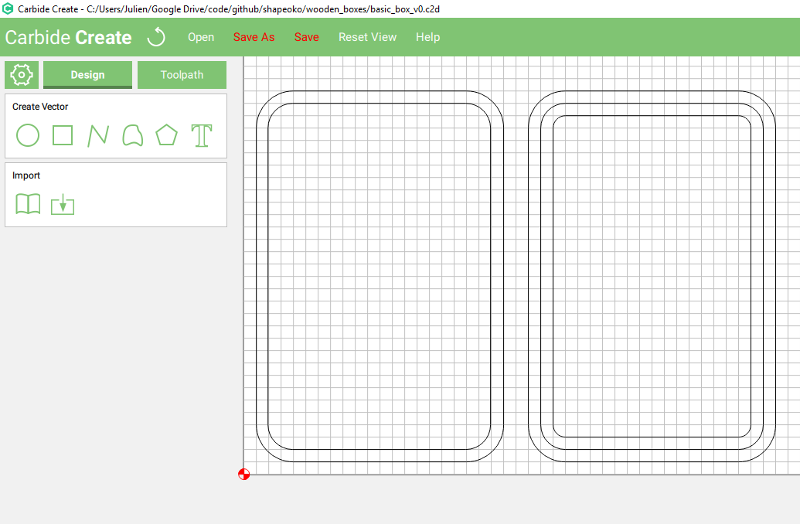 Also, I was getting tired to using tabs and having to clean them up afterwards, so I made sure to put tape underneath the cutout parts too, got rid of the tabs, and did a full-depth profile cut instead. and it turned out just fine. A little chatter now and then during the job, but nothing too heavy (and nothing that went away by reducing the feedrate, so my feeling is this must have been caused by some vibration linked to the relatively elastic holding provided by the double-sided tape). 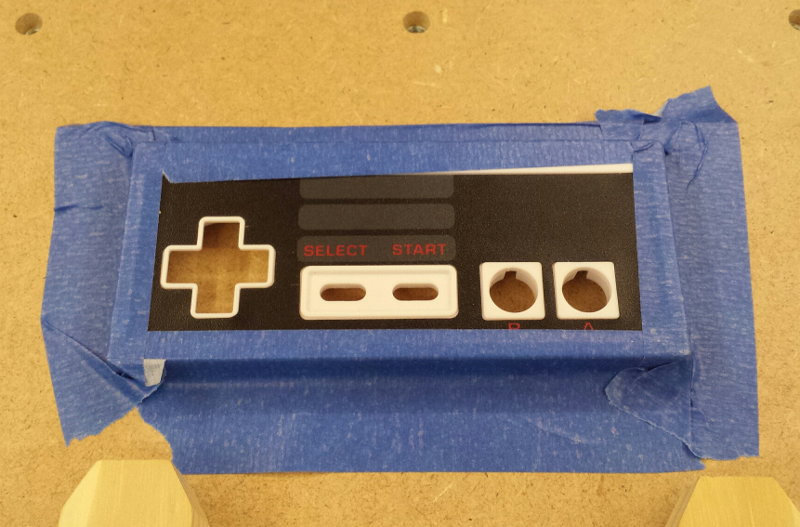 The top and bottom parts stayed in place till the end, and I had very little sanding/clean-up to do afterwards, so +1 for double-sided tape! Plungerate is the descent speed of the endmill into the material. 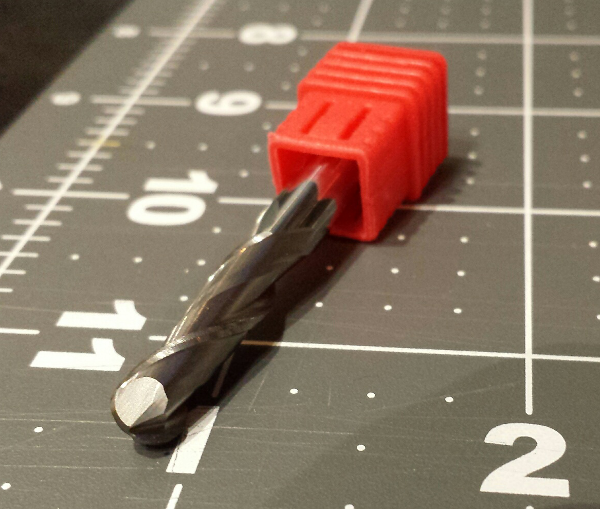 An endmill is not designed to drill into material like a drill bit, so plungerate should be small(er). 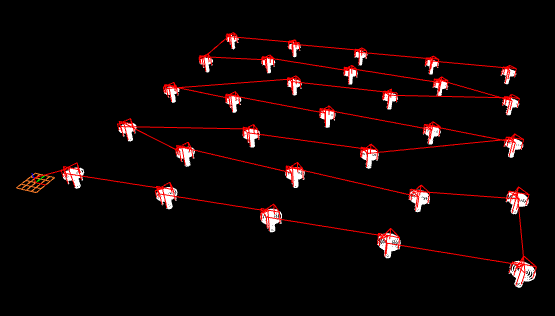 At this point I have not yet felt the need to optimize this parameter, so I just use whatever CC computes for me. Same for depth of cut/ plunge depth: I stick to CC’s recommandations, and in all cases I keep it below 1 time the diameter of the endmill. 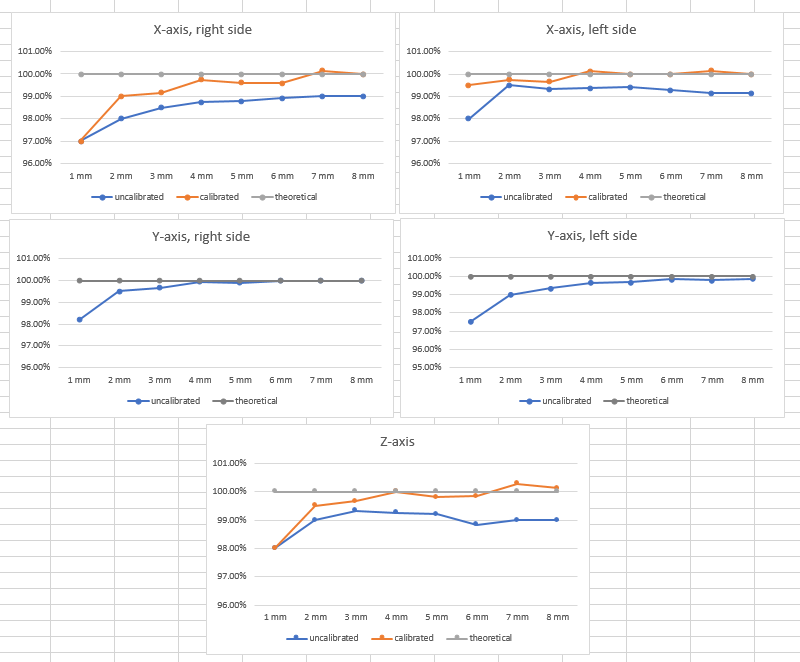 GRBL uses three values referred as $100, $101 and $102, which correspond to the number of motor steps to be commanded to move by one millimeter on the X, Y and Z axes respectively. 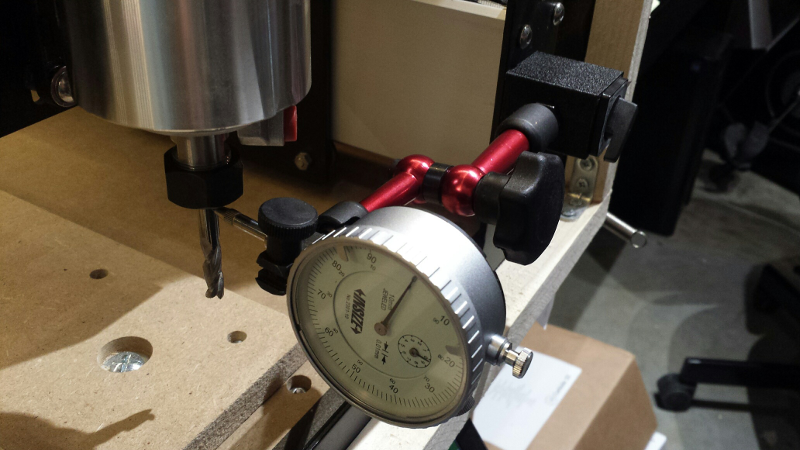 Adjusting these values is a way to compensate for slight inaccuracies induced by mechanical play between the belt and the motor pulley, and by belt stretching. 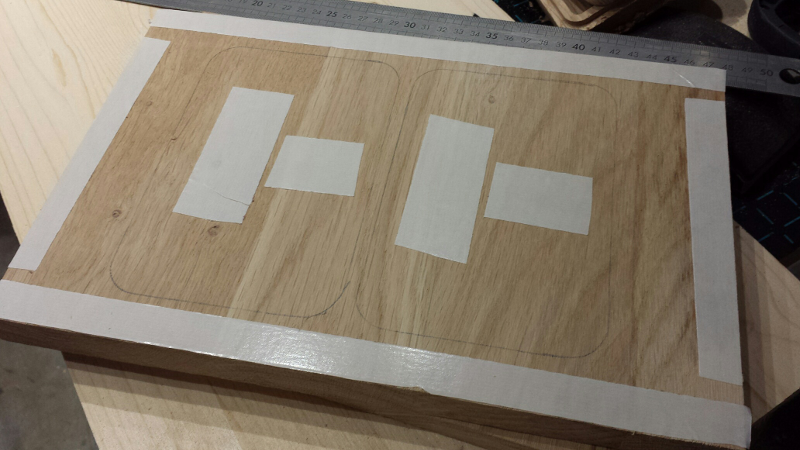 The easiest way it to just cut a piece of a given size, i.e. 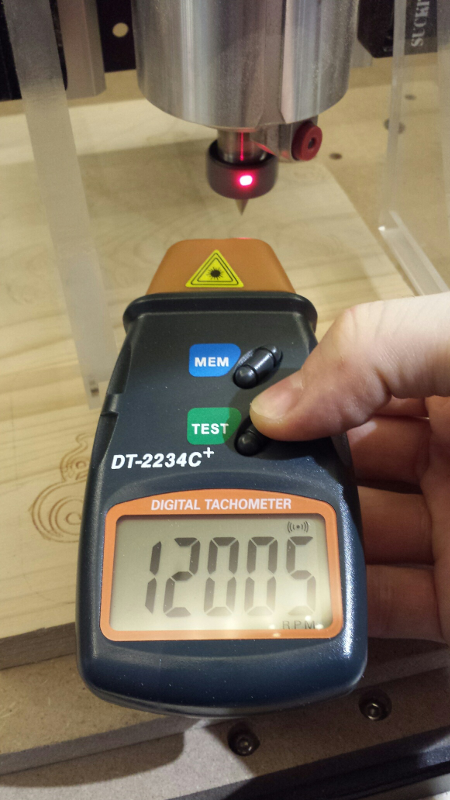 100mm x 100mm, and then measure precisely the actual X and Y size of the piece, and adjust the calibration values in the inverse proportion: By default, the shapeoko uses 40 mm/step for each axis. So overall I got somewhere around 0.2% error, which is more than precise enough for what I do. I’m pretty sure the measurement error and natural variations in the machine are of the same order of magnitude anyway. 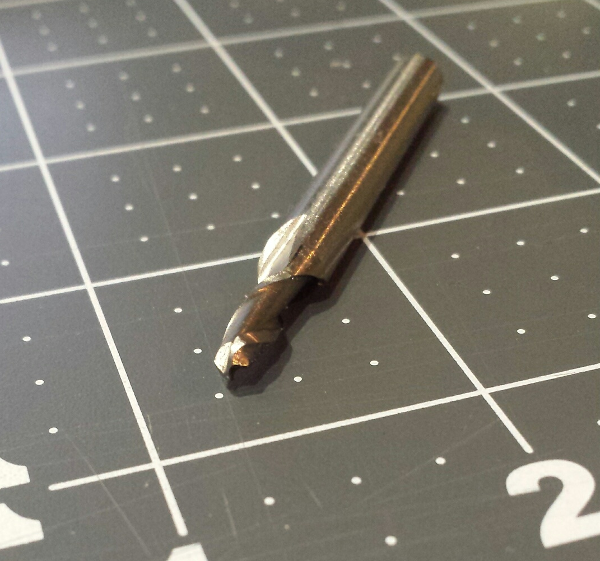 Nothing huge, but a sign that the endmill was probably slightly tilted. The fact that the stripes were only visible in one direction (corresponding to the endmill travelling along the X axis), and no visible stripes in the other direction, probably indicated that the spindle was tilted towards the front/back, but not (too much) to towards the left or right. Not perfect, but MUCH better. Since I modified the machine geometry slightly during this adjustement, I re-surfaced the wasteboard to make sure it was parallel to X/Y axis again. I re-run the initial pocketing job, and sure enough the situation improved significantly: you can still see some stripes, but they are much less visible. 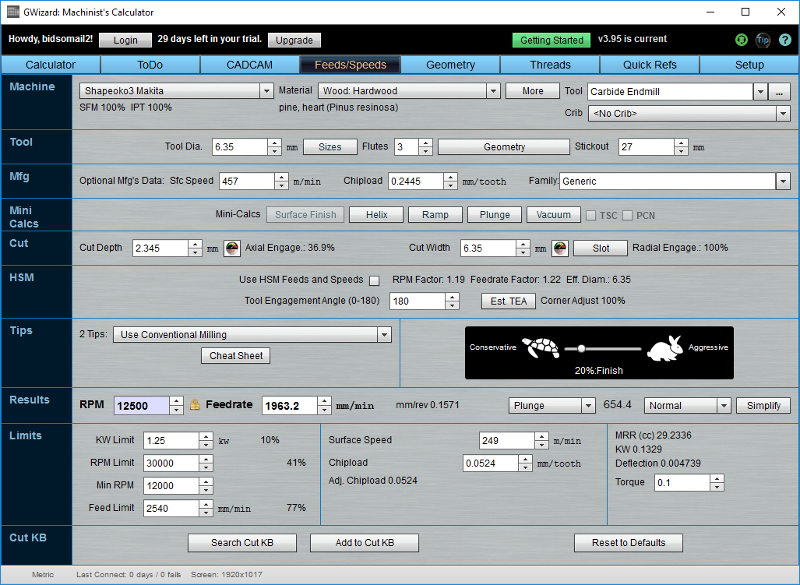 This great tutorial presents an experimental way to determine the right feeds and speeds for a given material/endmill combination. I definitely want to try that someday, in addition to the theoretical approach/G-wizarding. 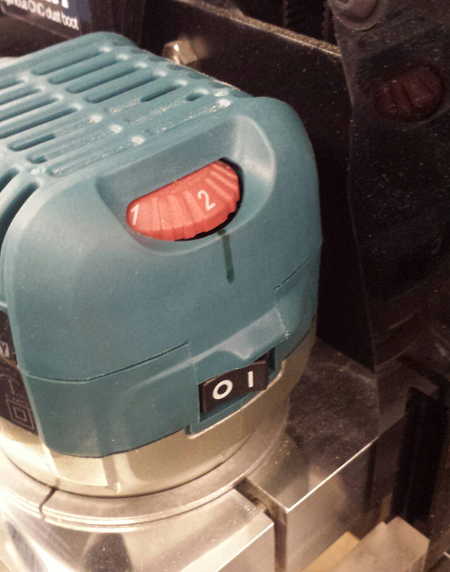 I initially trusted the Makita manual about the RPM I would get when turning the speed dial to a given index, but felt the need to verify the actual RPM I was getting, and more importantly how exactly to place the dial, since there is no marking on the router body, and one can only guess that the index should be aligned “somewhere in the middle”. So I went crazy and spent 12 euros on a tachometer to check this. The tachometer is just a glorified laser pointer, that measures reflected light off a rotating object, and counts the number of light intensity transitions per second. So the help this process, a piece of white tape must be placed on the rotating part, and the laser aimed at it. Interestingly, the mark is not exactly in the middle, so it was worth checking, and the mark gives a useful visual indication to tune the dial in any case. I know that a 5-10% error in the RPM is not going to affect the chipload that much, but when experimenting with feeds and speeds I might as well get the RPM I am asking for, not 10% less or 10% more. but would take 2hours+ to cut, so I did not bother trying it. 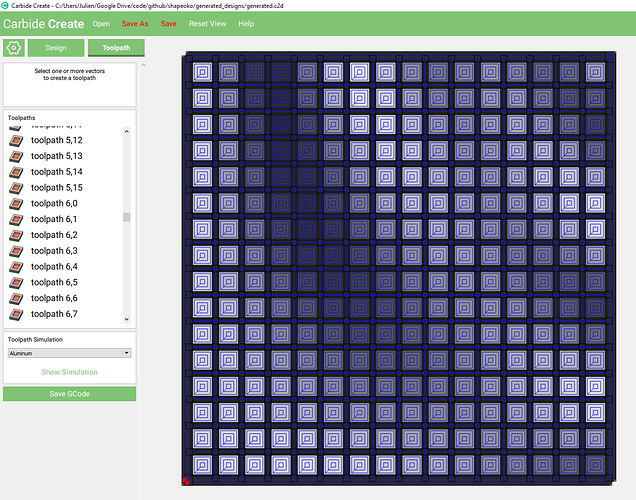 Proof of concept for future use of generated CC projects: check. The python script for this is here, and the generated CC project file is here. 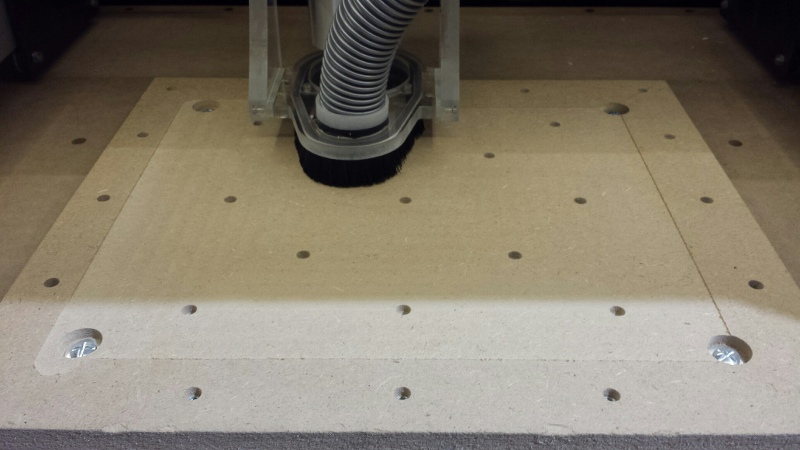 Even when using a dust shoe, some amount of fine dust ends up going everywhere on the machine over time. It’s not a problem, until it accumulates beyond a certain level, and may cause subtle imprecisions in the gantry movements for example. No big deal, but I prefer to keep things tidy, so I try to clean-up around wheels & belts every few weeks using Q-tips and/or a toothbrush. We’ll see if I can sustain that discipline on the long run…or maybe stop worrying about it. Makita Carbon brushes replacement parts reference is CB-411. I ordered a couple of those, since sooner or later they need to be replaced and I’ll be glad I have them on hand. 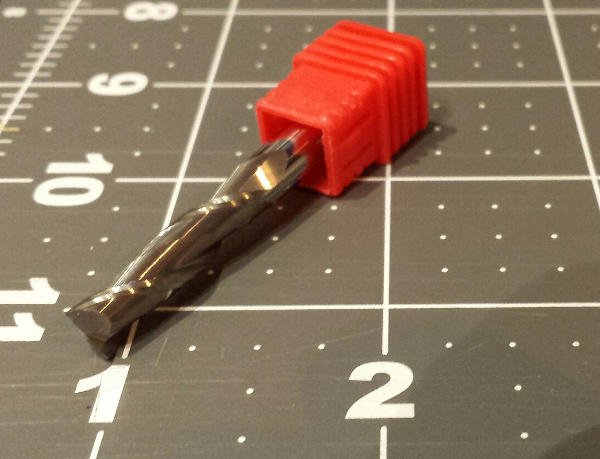 Cleaning endmills: I use acetone, which removes any remains of plastic/glue/sticky things very efficiently. 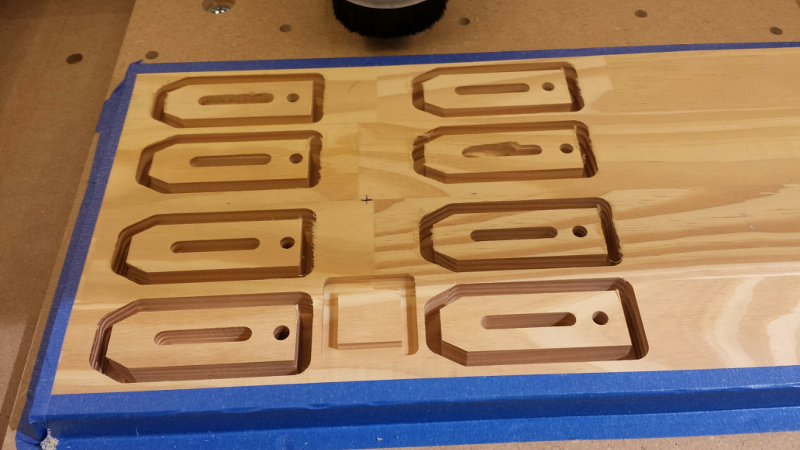 the Shapeoko3 is a GREAT machine. I’m already pleased with its performance, and my machine is not even properly calibrated yet. 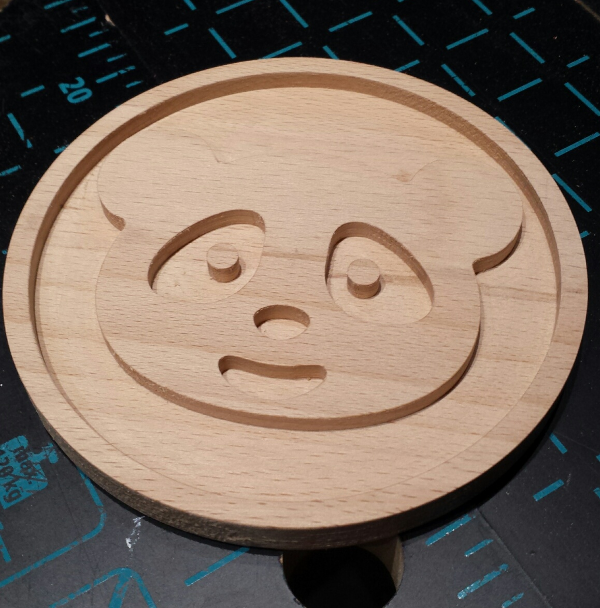 I can already see myself being sucked into the rabbit hole of CNC, this stuff is addictive and there is so much to learn. 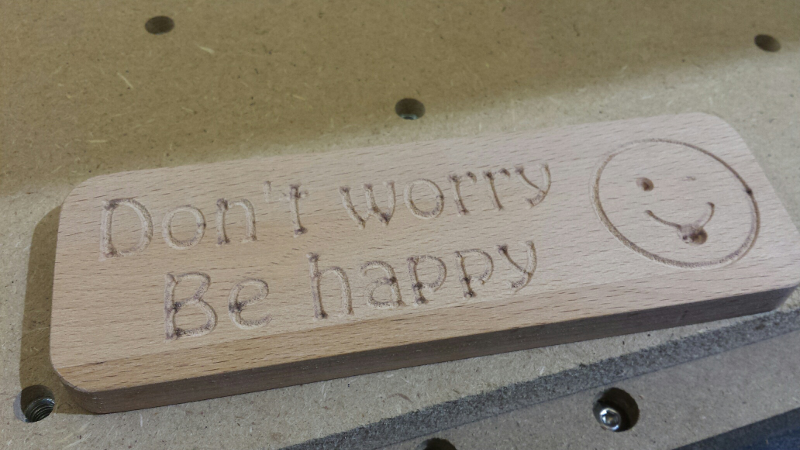 CNC is not a cheap hobby. 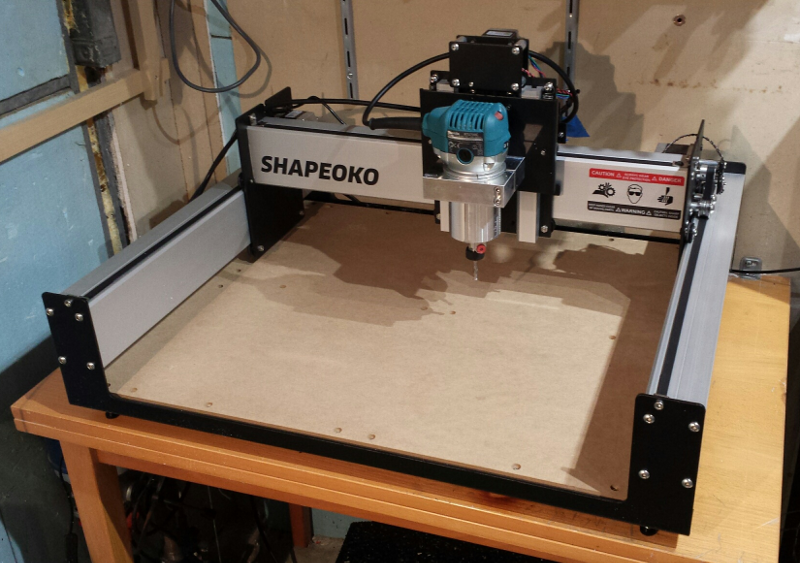 The Shapeoko is quite affordable and worth every penny, yet with all required accessories the entry cost is somewhere around in the 1500-2000 euros range. I read somewhere the motto “measure twice, cut once”. I would say “measure twice, then recheck everything one additional time, and then cut, while keeping your hand on the power switch”. There are many opportunities for getting something wrong. 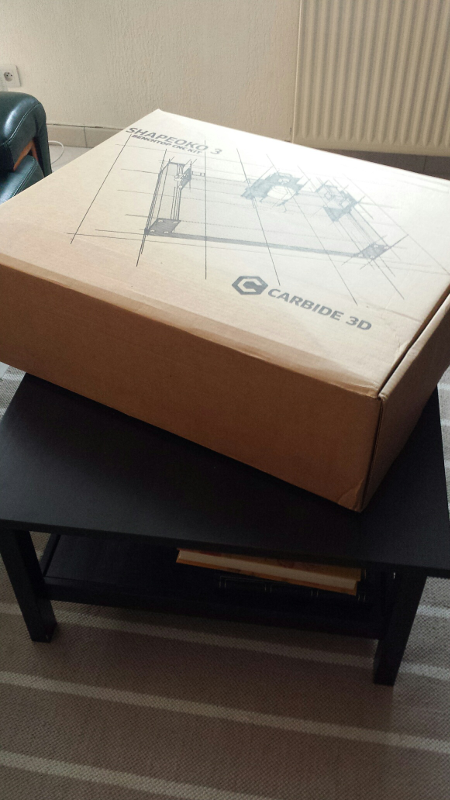 Carbide3D’s support has been excellent. It’s a small company, and getting to interact directly with the designers is a huge benefit. 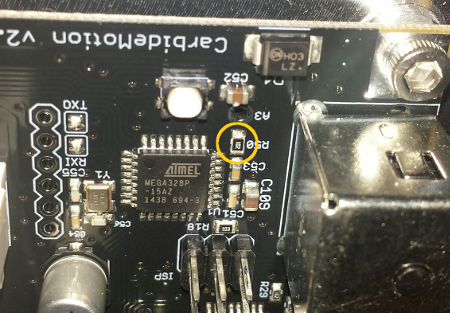 My initial controller reset issue was fixed remotely in a few days, and when I later had an unfortunate failure of a stepper driver, they shipped a replacement board immediately. 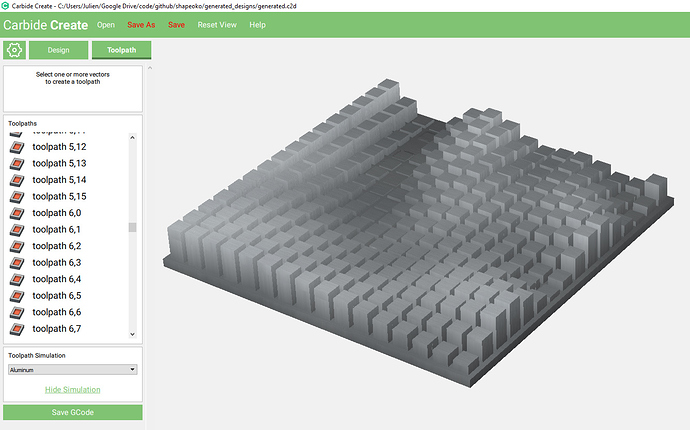 Carbide3D’s online community has been very helpful too. A lot of expertise/information from CNC veterans can be gathered there.